Hi Friends! 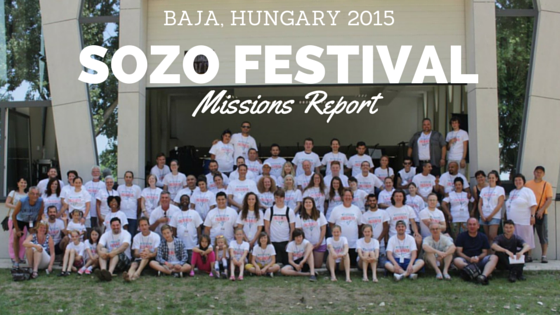 Here is our most recent missions report loaded with pics and details. 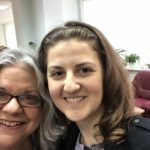 During the month of May 2017, Ivalene and I embarked on an epic discipleship trip teaching and doing worship ministry in Ukraine, Bulgaria, and Hungary. It was an amazing experience! 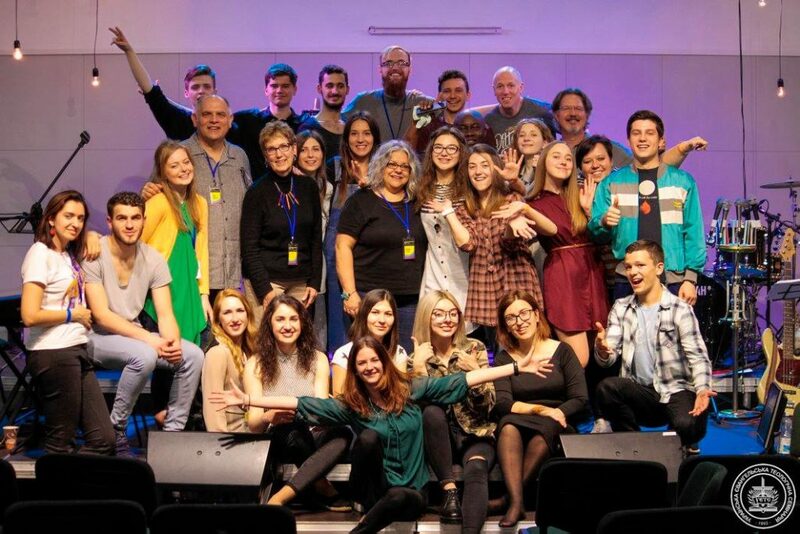 This was my 17th (seventeenth) consecutive year ministering in Eastern Europe, our 6th (sixth) international trip together, Ivalene’s first trip to Ukraine and the first trip to Bulgaria for both of us. We saw the Lord move powerfully through answered prayer in our times of ministry throughout the entire time we were overseas. 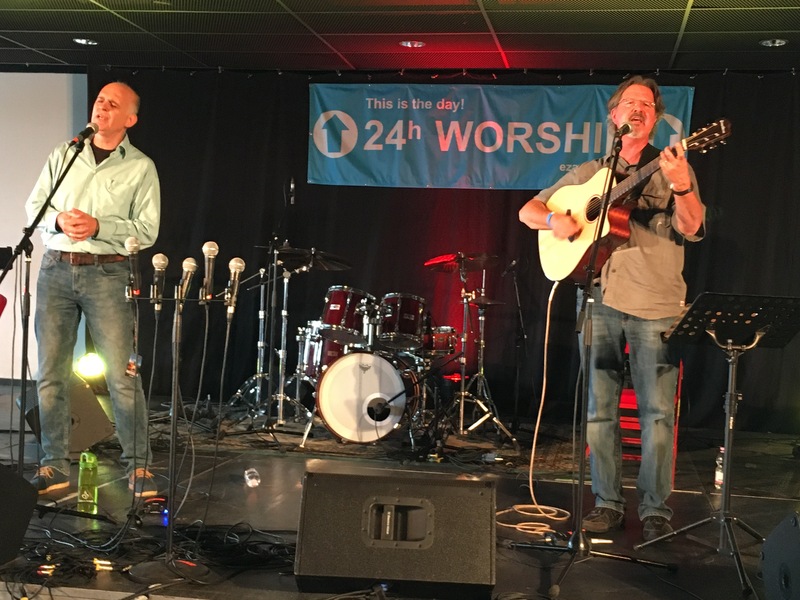 This trip affirmed there seems to be an on-going need need for Biblical discipleship – teaching, encouraging and impartation – in the areas of worship ministry. We were able to meet this need in our own unique way. People were hungry, receptive and appreciative. This was a great blessing! 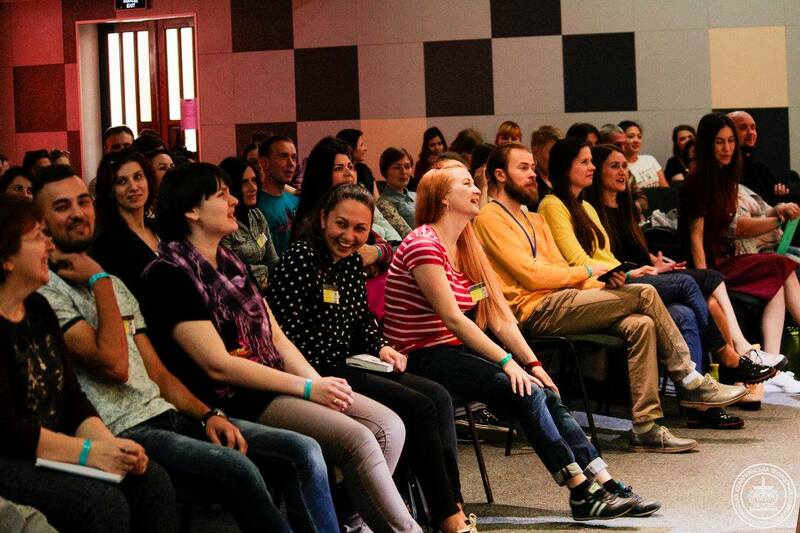 The Holy Spirit truly helped us teach and communicate effectively. We were very encouraged by the feedback from those we were serving. Angels were working overtime to keep us healthy and safe in travel. We faced some challenges and difficulties, but the Lord saw us through every one. The Lord proved himself to be very good! Our faith has been elevated and we are so grateful for His provision. On a very practical note, we are most appreciative of our many friends and family who supported us in prayer and finances. Here’s a brief recap of how we served. 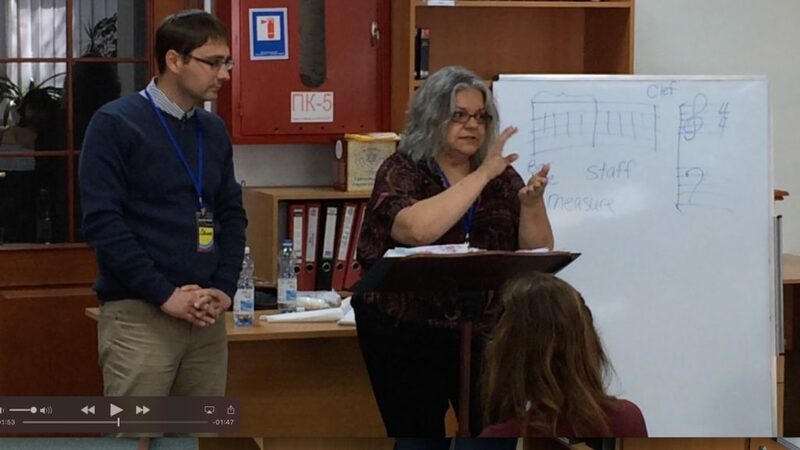 The first week, Ivalene and I were part of a team of 8 seminar instructors at the “Music In Worship” conference May 4-6 in Kiev presented by Ukrainian Evangelical Theological Seminary. 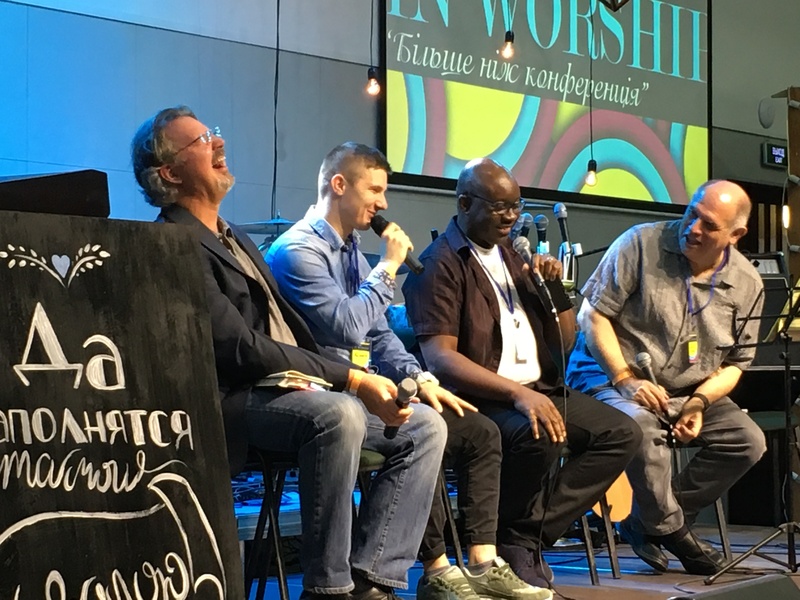 “The most important idea I learned from the conference is that I’m not just a musician, I’m part of the kingdom of God, and my task is not just about music but to release the breath of God and His presence. 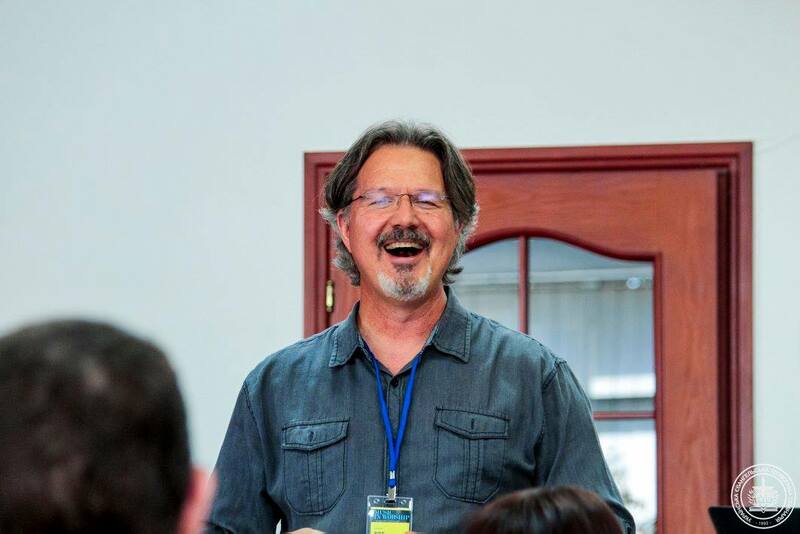 This was a very professional teaching conference – spiritual and very powerful. Alexander S.
Ivalene taught two extensive workshops on Children In Worship. 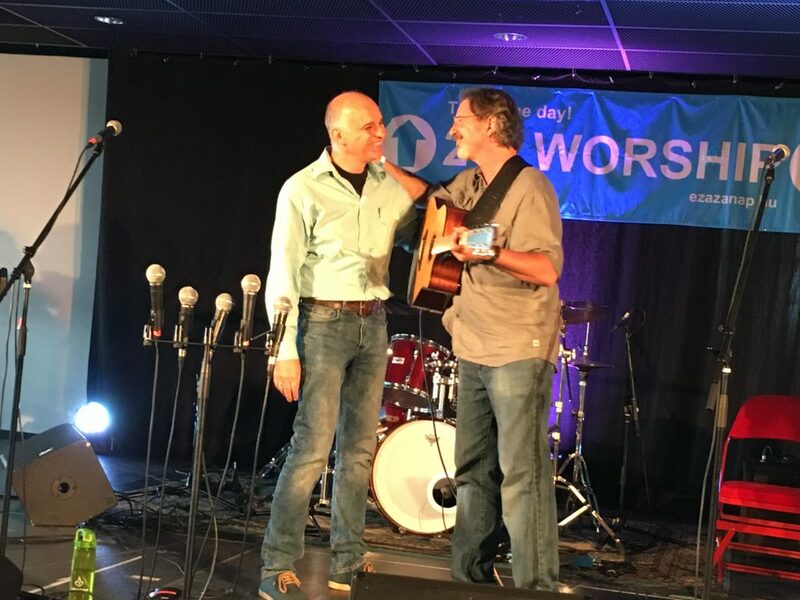 My workshops included 3 Songwriting Workshops, a morning main session on Healthy Spiritual Leadership, and seminars on “How To get Your Church to Sing” and “Worship Ministry Blueprint”. There was a huge interest in the songwriting seminars and they were all very well attended. Our class even wrote a pretty good song in Ukrainian! 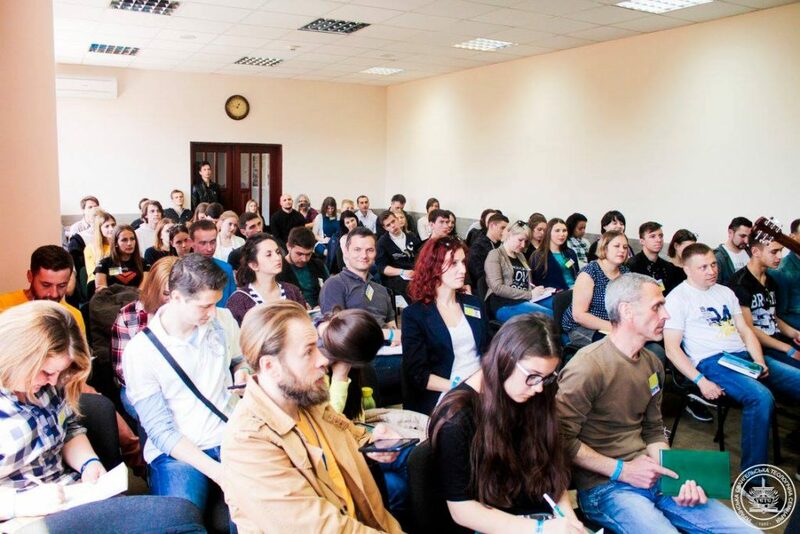 The attendance and energy level at my songwriting workshops was really high. Ivy Teaching – class participation required! The Children in Worship class participates! 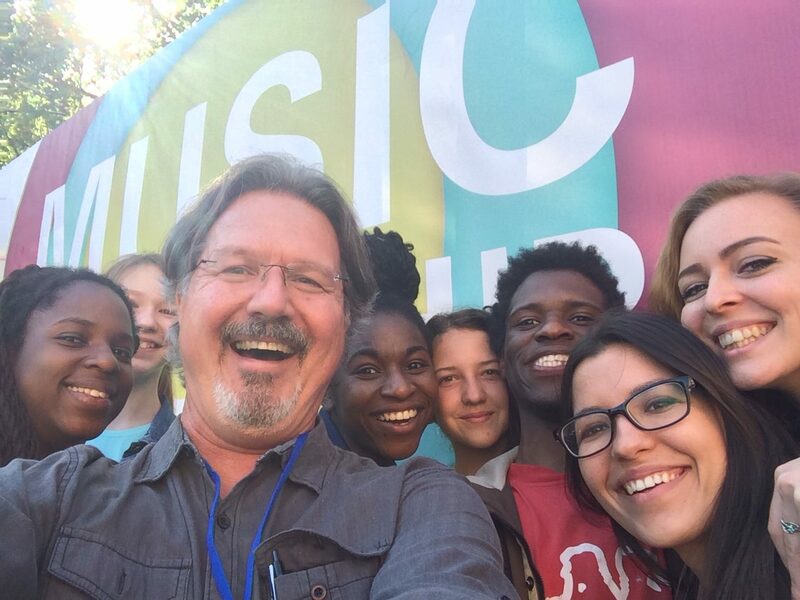 Our very dignified group of academics and professional musicians …. ? From England and USA. 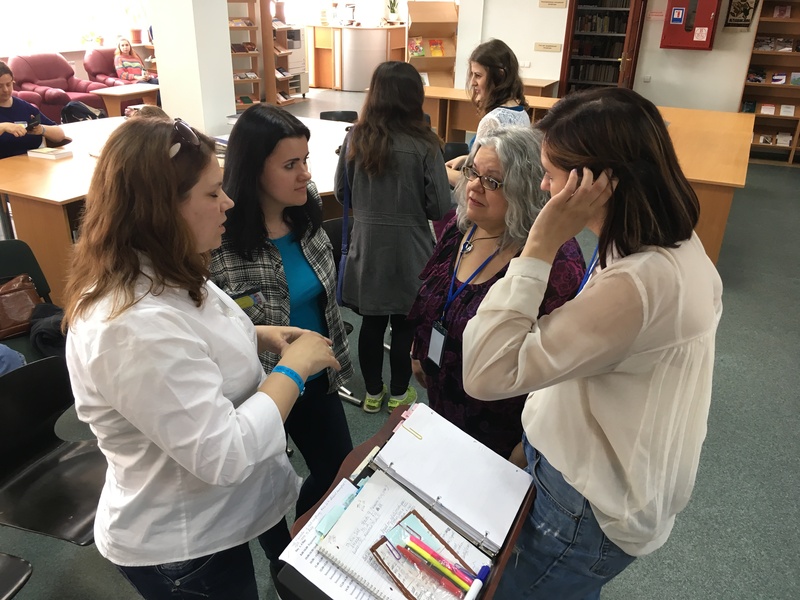 Leadership Team Prayer – an everyday necessity, of course! My good friend Fred Heumann, a regular instructor at UETS, was the visionary behind this conference. Also in this pic is Daria, one of our translators who was a great help to Ivy and me. 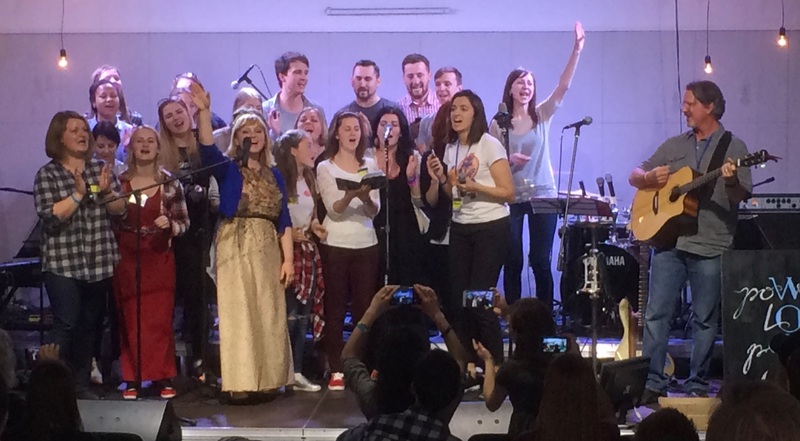 We haven’t seen such a high level worship music conference before in Ukraine. The speakers were true professionals. We learned much we did not know in terms of leadership. although we are not new to music. We must attend next year! 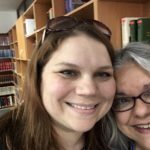 Larisa L.
One good place to start when learning to write worship songs is with a “Scripture song”, setting Biblical text to music. The Psalms lend themselves to this task since they were all song lyrics in the first place. 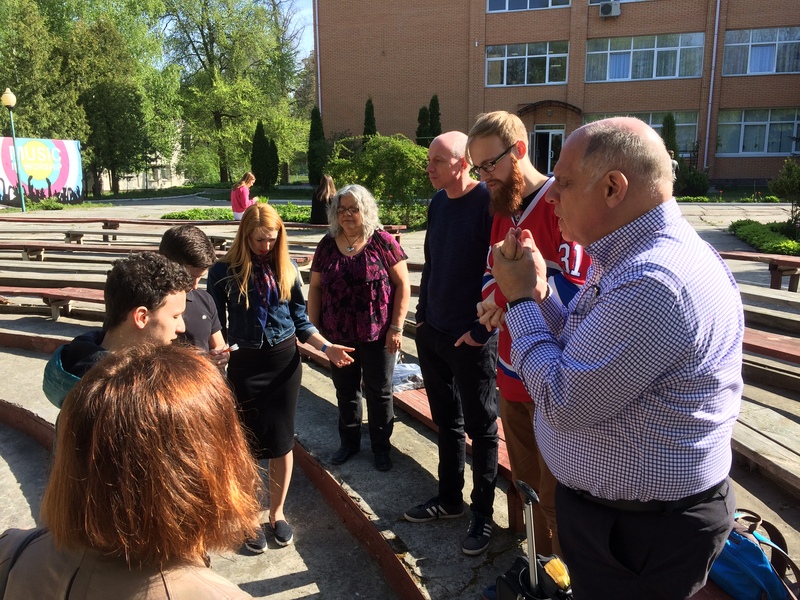 We used the Ukrainian text for Psalm 136:1 “Give thanks to the Lord for He is good, His love endures forever” as a verse and Psalm 150 “Let everything that has breath praise the Lord” as a chorus. Then we break down the cadence of the syllables and find the natural rhythm of the phrases in Ukrainian. From that we brainstormed (and sought inspiration from Holy Spirit!) for melody ideas. Different members of the class would sing suggestions and we would get feedback. One of my rules for creative development is “all ideas are good ideas until proven otherwise”. This leads to a safe positive environment where ideas can be created and refined with no criticism or performance anxiety. 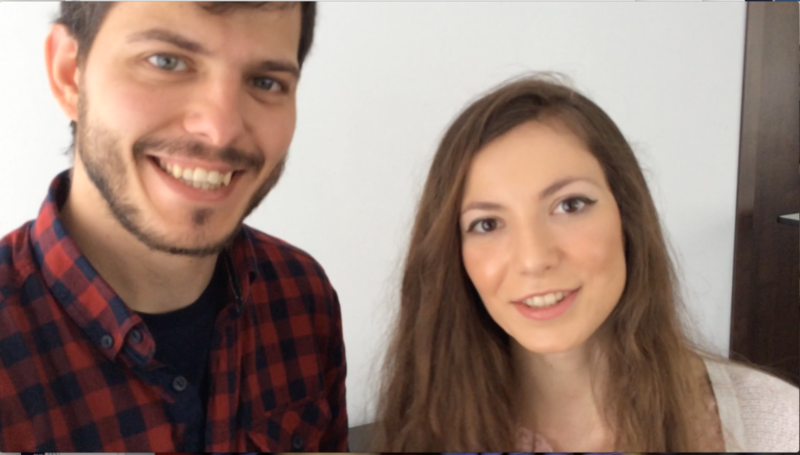 Eventually, we crafted the class ideas into a nice little song they thought was great in Ukrainian. That’s the most important thing, to teach, inspire and encourage folks to write freely in their own heart language. Ivalene teaching “how to teach” music fundamentals for children. 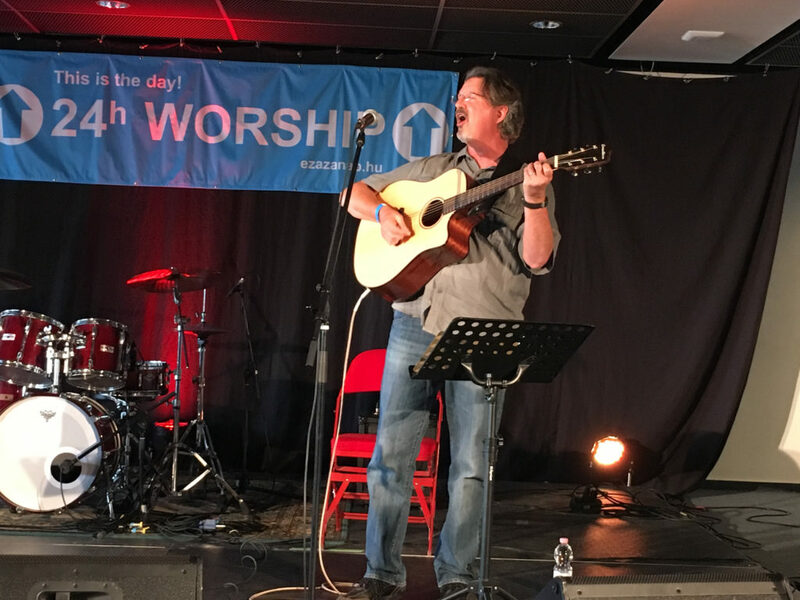 Leading worship with Fred Heumann, Steve Thompson and the other instructors for the closing session of the conference. Playing with Loic, Steve and John from the UK. 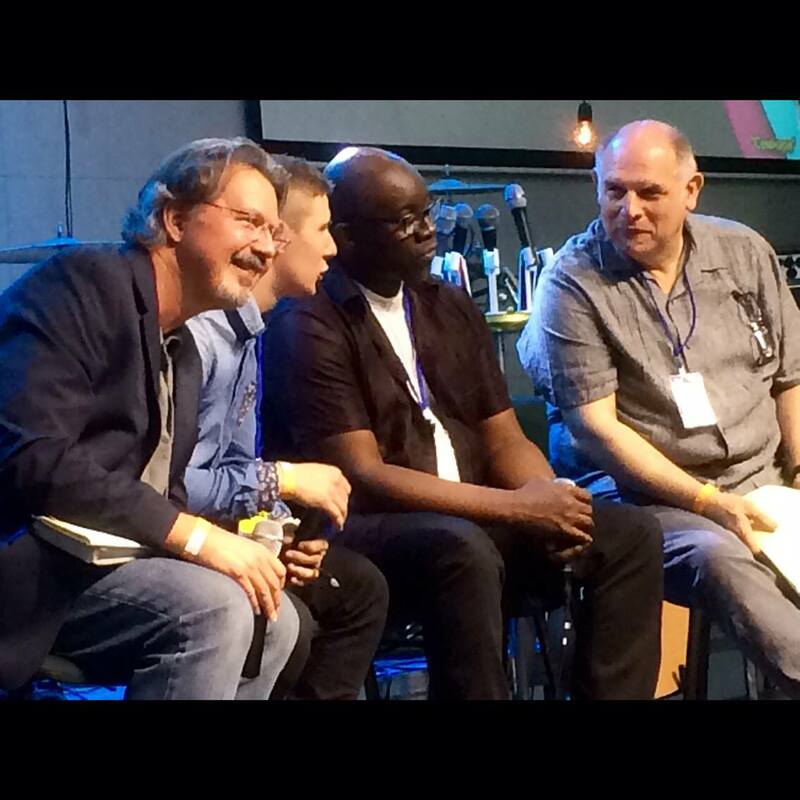 We had a panel discussion on worship leading Q&A. Steve Thompson cracked me up. My class cracked me up too. The joy of the Lord is our strength! Everyone made a lot of new friends, which is part of the point also. The seminary is an oasis of peace and good will in a very tough country. 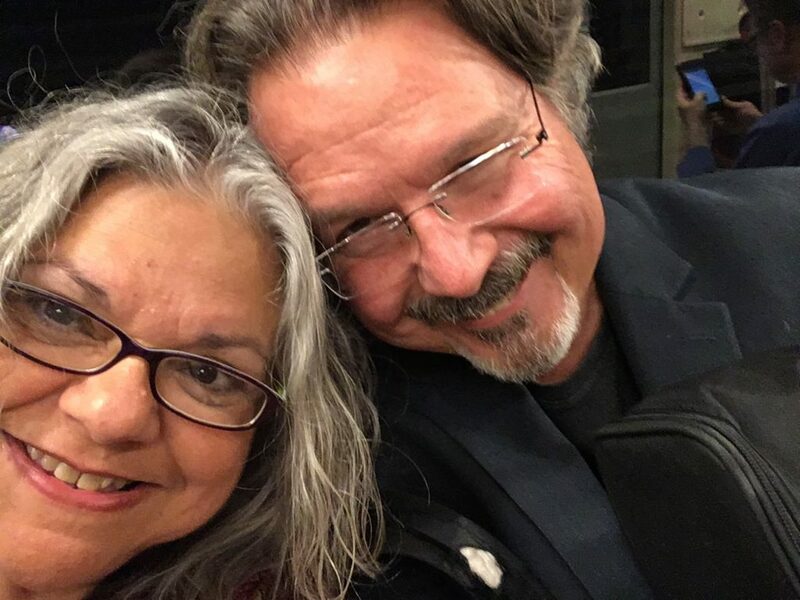 The joy of the Lord permeated our time together. This is most of the UETS students and faculty who served to put on the conference. A fantastic team building and learning experience for them! 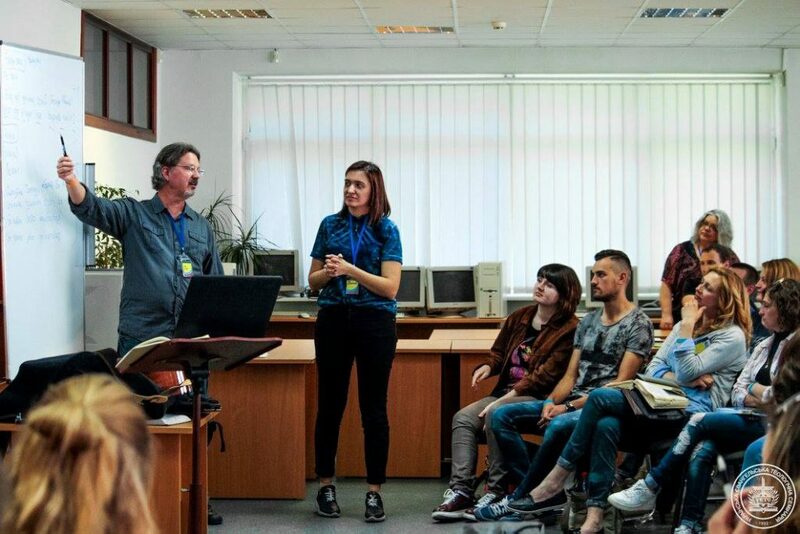 The staff was about 38 UETS students and faculty, plus our team of 8 international instructors. Top: Left side of the room. Bottom: Right side of the room. At the end of the event, the atmosphere was electric. No one wanted to leave. The participants spontaneously took the microphone and expressed their appreciation for the event and all who had worked to put it on. Then they all prayed for us. It was amazing to experience. 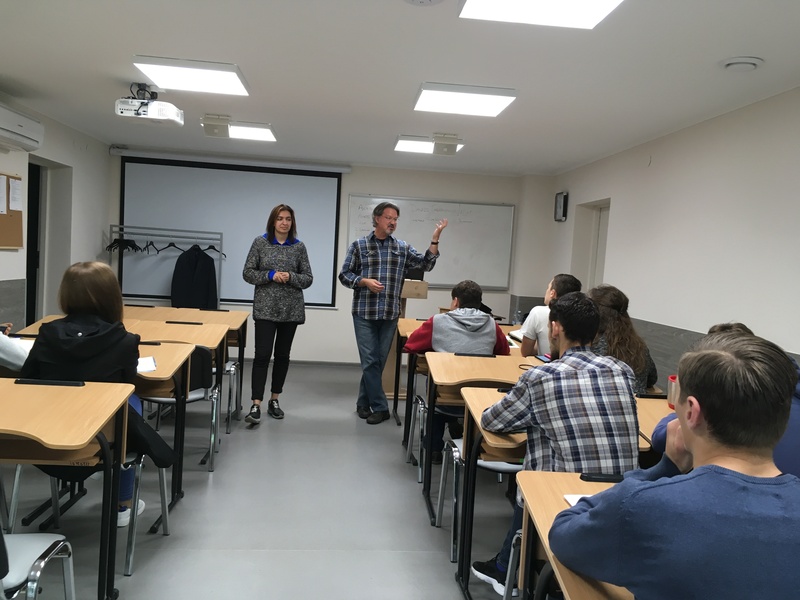 The next week Fred and I were guest lecturers at the Ukrainian Evangelical Theological Seminary, teaching two to three classes daily. 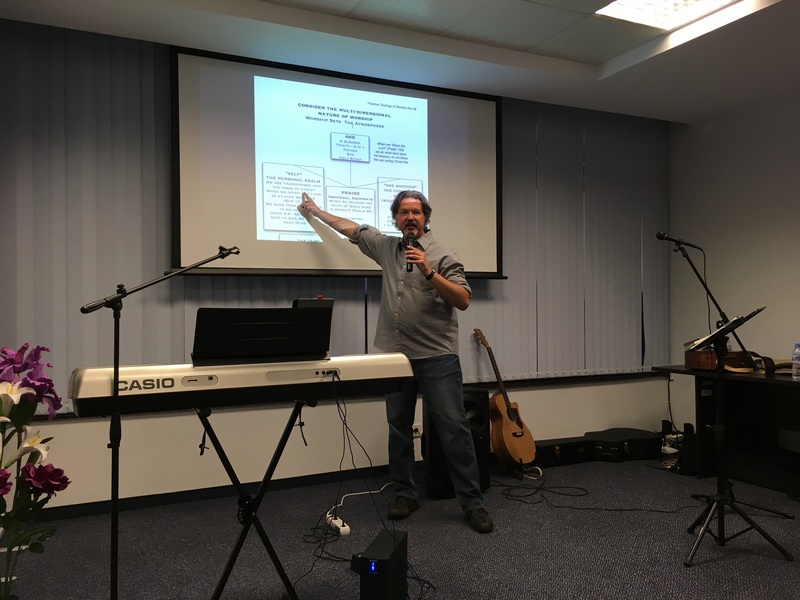 Teaching practical theology of worship. Practical application of “prayers of the people” using music. 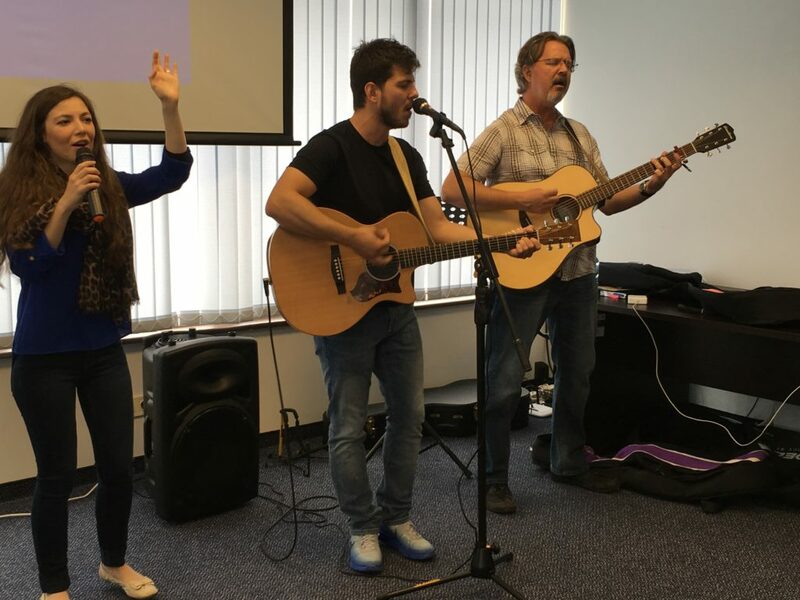 Our assignment in Bulgaria was to lead a Worship Weekend for a small network of churches and ministries in Silistra (on the Danube River border with Romania). 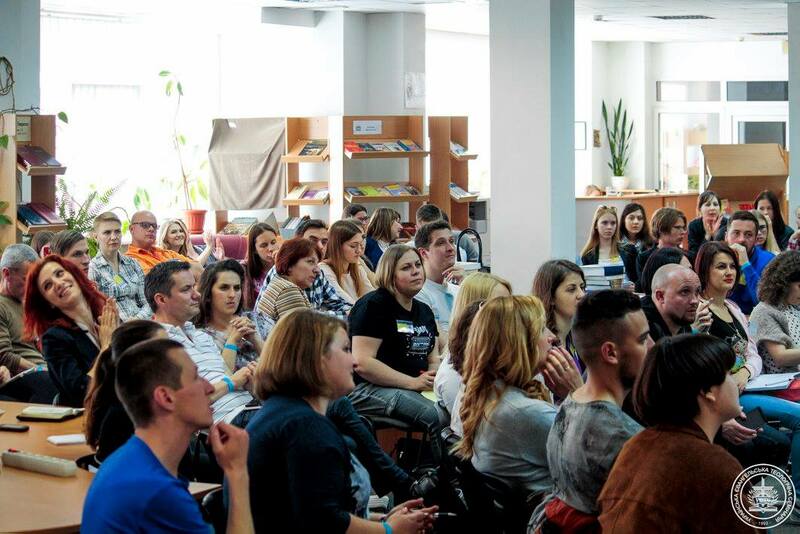 The event was hosted by our friends from SOZO Festival 2004 Marko and Tsetsi Marchenova. 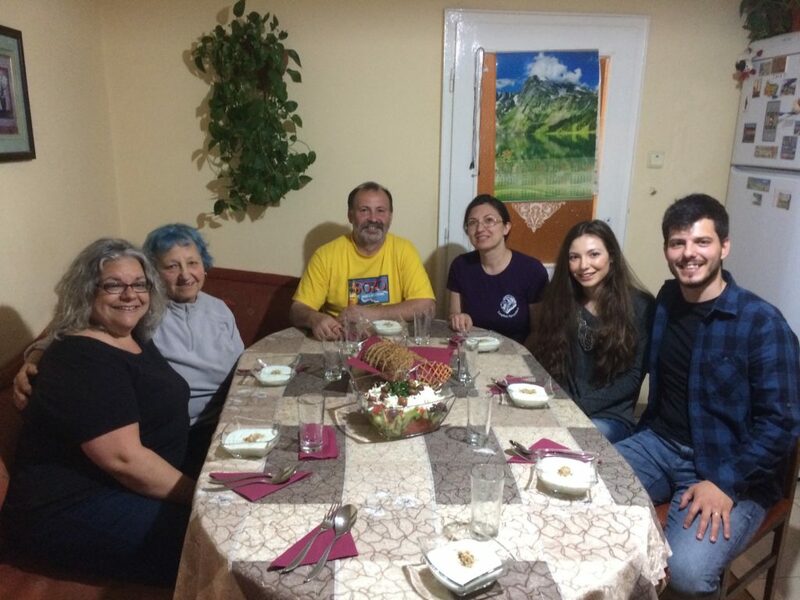 We experienced Bulgarian hospitality (and great food!) first hand as we stayed at their apartment. 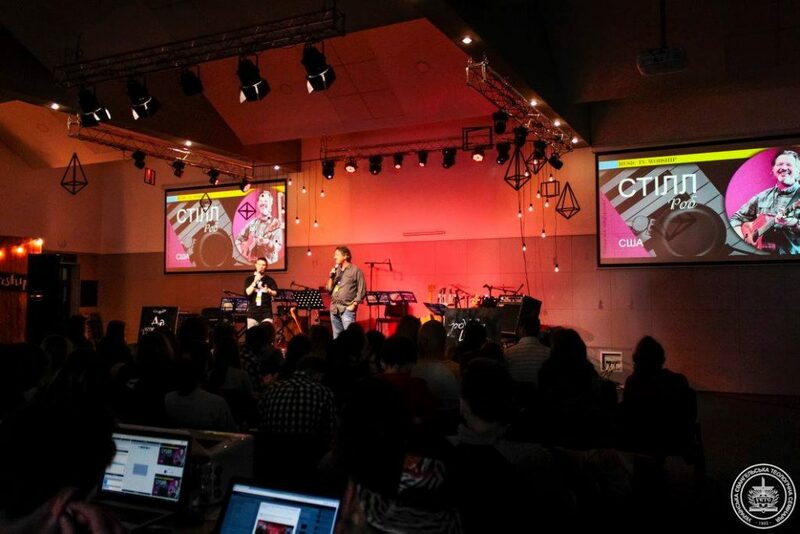 The workshops were held Friday night, all day Saturday and Saturday night, then concluded on Sunday morning. God is doing a good work there. We also made a great connection with a group of Christian medical doctors and counselors. They were so excited and are making plans for us to return. They expect the next event will be bigger and better. 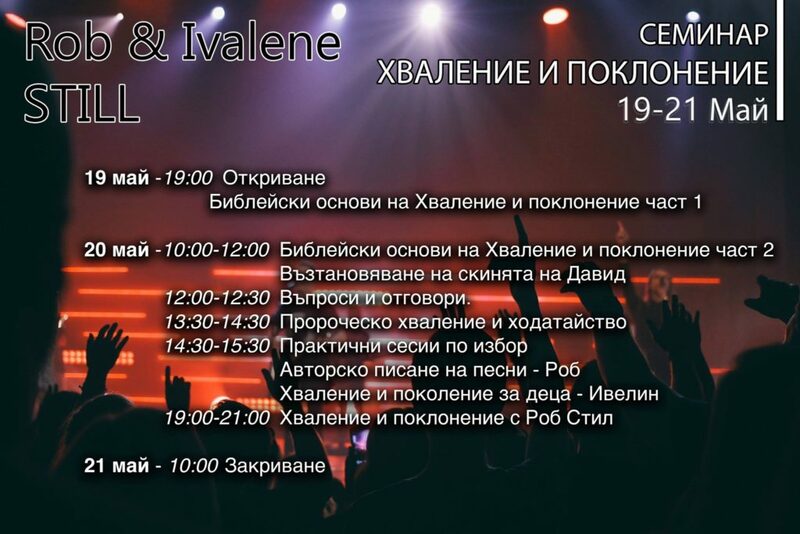 This was the poster promoting the worship workshop Ivalene and I were leading in Silistra, Bulgaria. 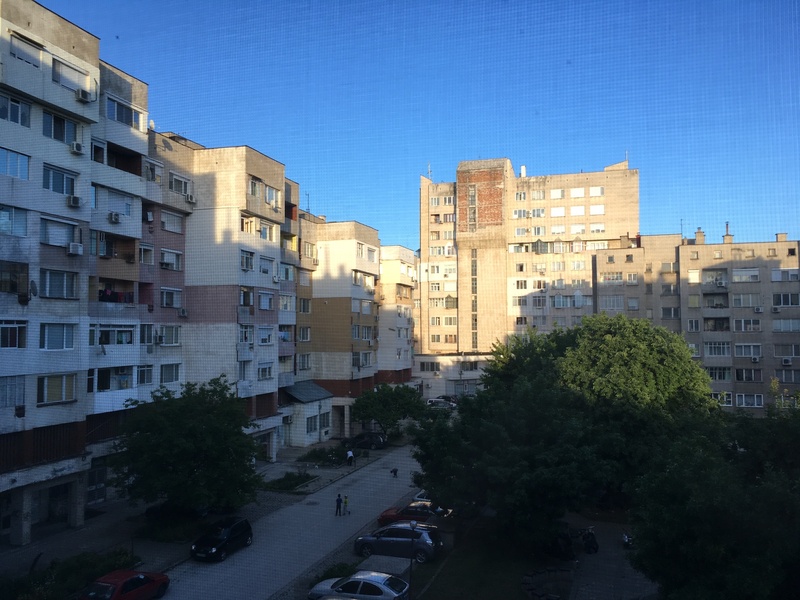 Our hosts apartment complex, built during communist era. Our hosts: Pastors Marcho and Tsetsi are in the center, to their right are Vyara nd Koko (daughter and son-in-law, worship leaders) Next to Ivalene is “Mama’, Marcho’s mother. Ivalene got a laugh out of meeting “Pepperoni” the bunny. 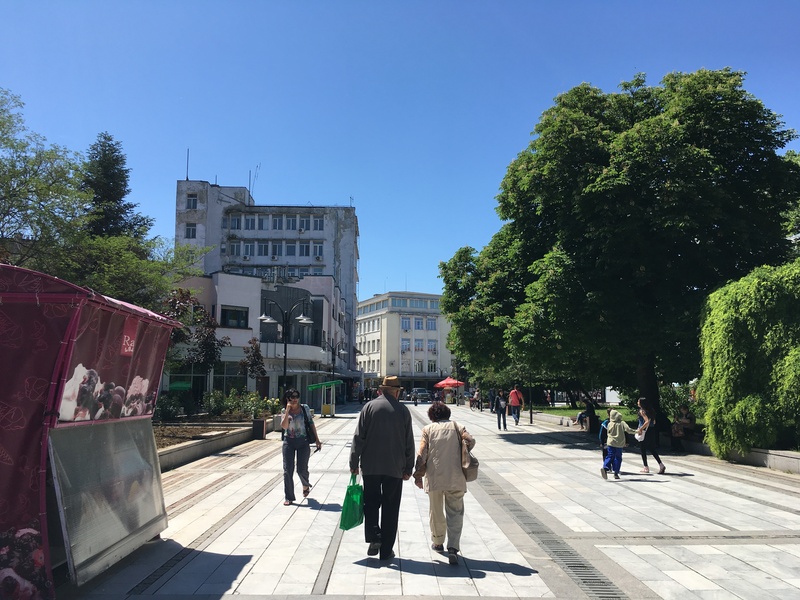 This is one view of the Silistra, Bulgaria city center. 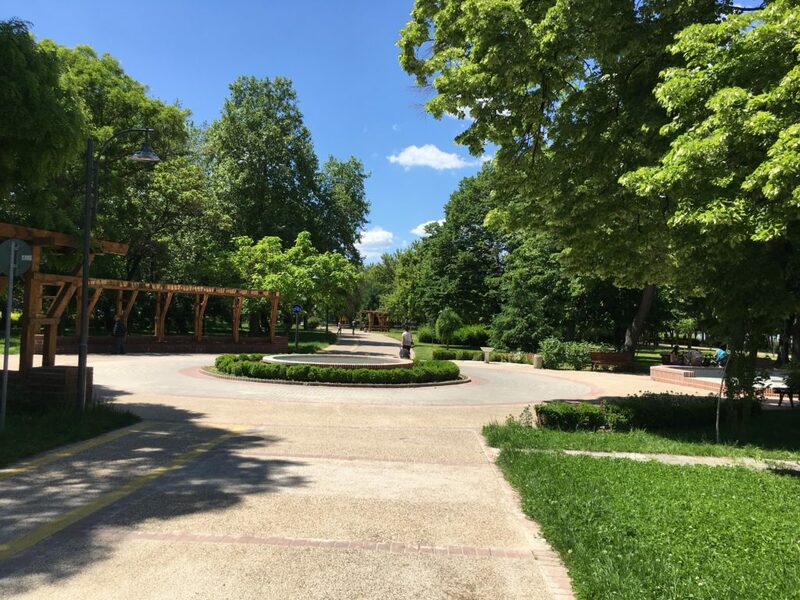 City park in Silistra “prayed in” by intercessors from SOZO Festival some years ago. Dinosaur. This dinosaur replica was handmade by Marko and Tsetsi at great personal investment. Their church hosted a Christian presentation of creation and evolution. 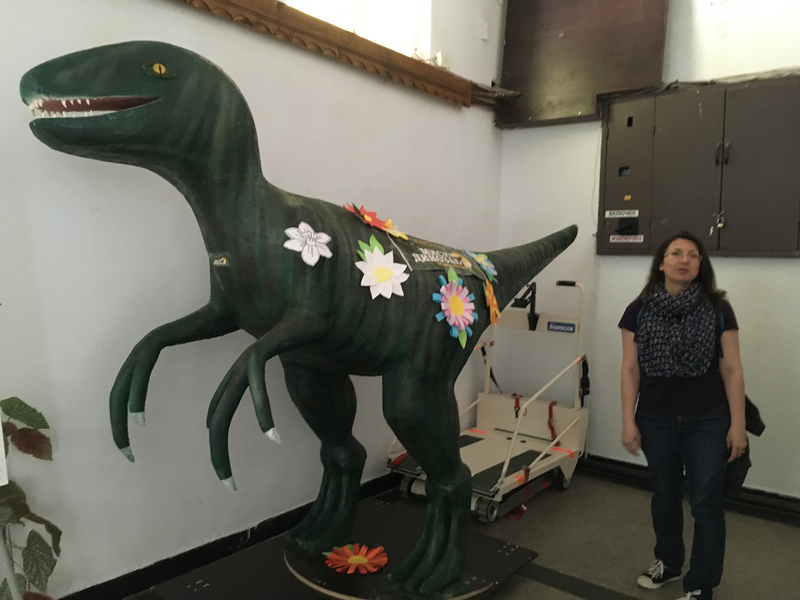 The dino is on display at the public library. Koko and Vyara lead the worship team. I had fun playing along with them. Worshiping together. The presence of God was so inspiring! 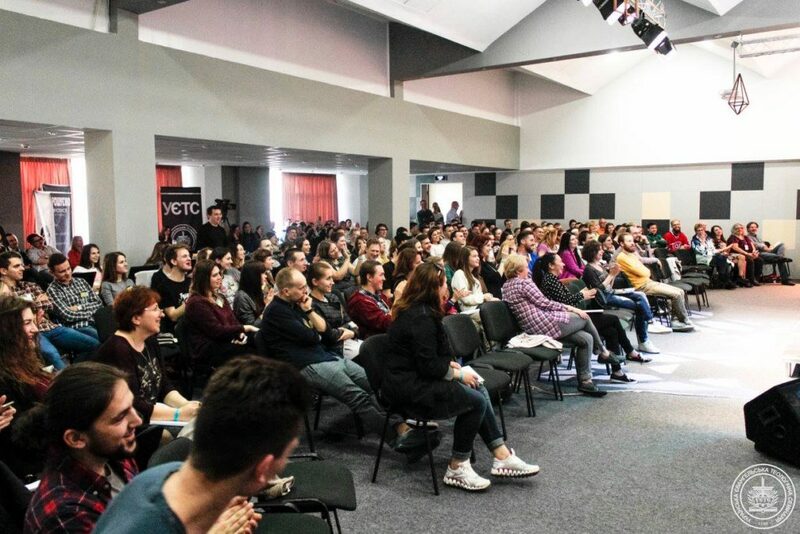 “Many people said that they had never been to a worship seminar in Bulgaria before… or ever (heard) a preacher talk about worship at all. 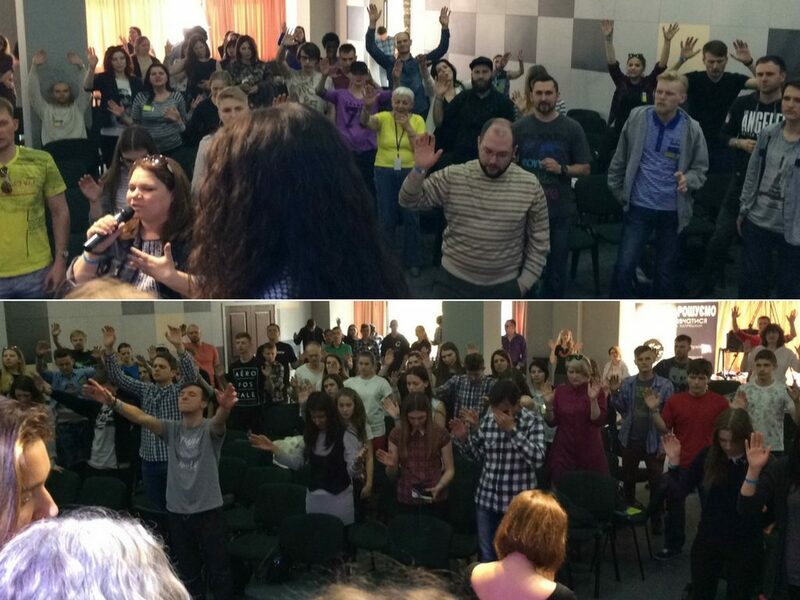 People in Bulgaria are hungry to know worship. 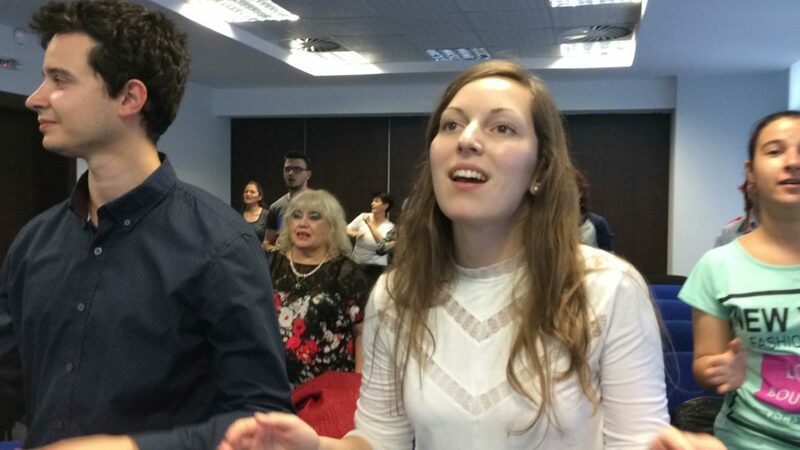 And worship leaders in Bulgaria really need some encouragement, to go deeper, and even for the congregation. Our group before crossing the Danube into Romania. 19 Airports in 10 Countries. 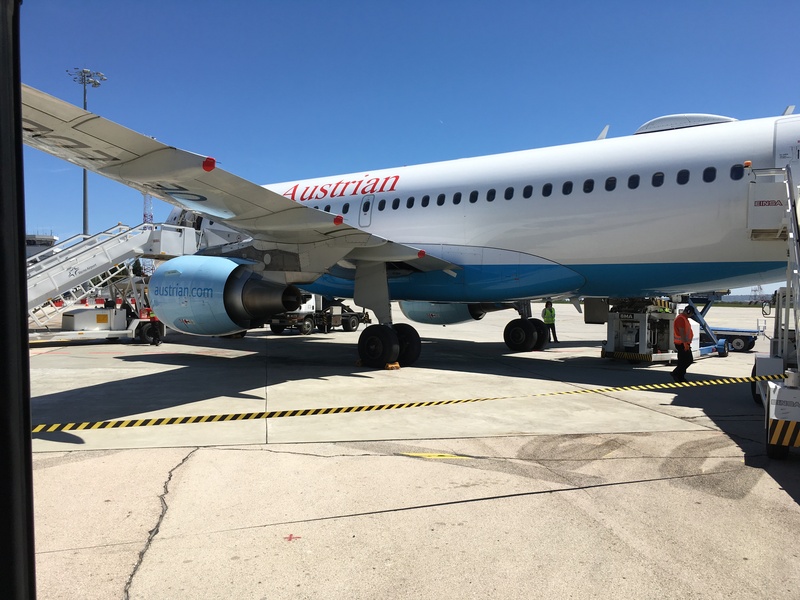 Our trip, including connections, involved 13 flights, 19 airports in 19 cities across 10 different countries. Plus buses, car taxis, trains, bicycle taxi’s, and water taxi’s and subways. 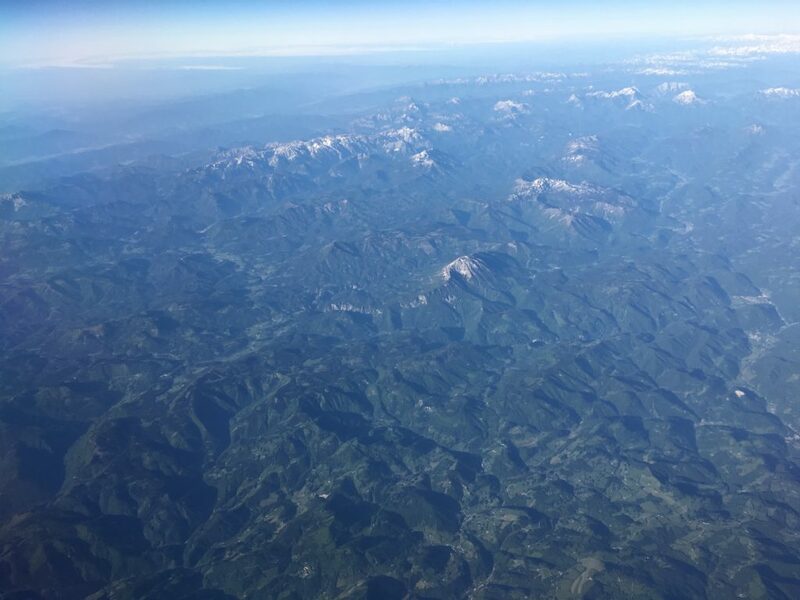 This pic is over the Swiss Alps, I think. 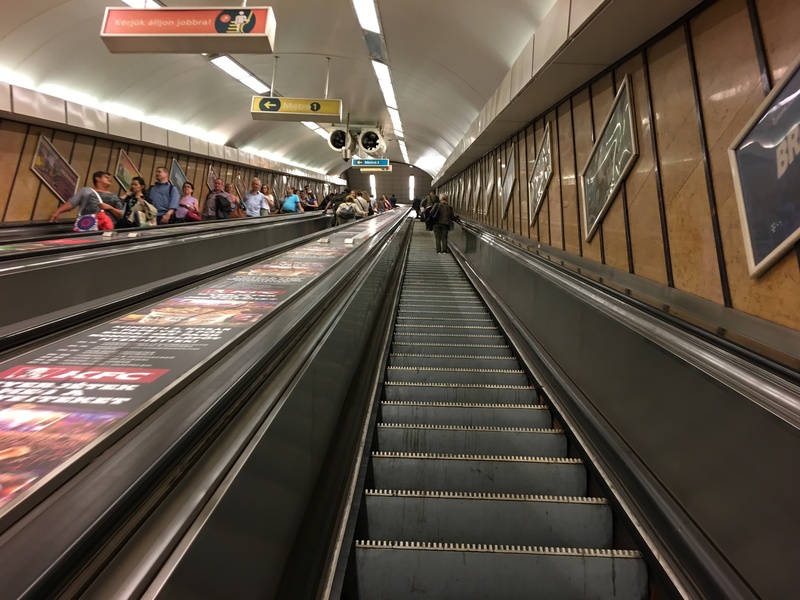 The metro in Budapest, steep elevator! On the Metro headed to the YWAM coffeehouse in heart of Budapest. Afterwards, Ivy got a pretty nasty gash on her finger that was a real problem for the rest of the trip. PTL, it’s healed now. 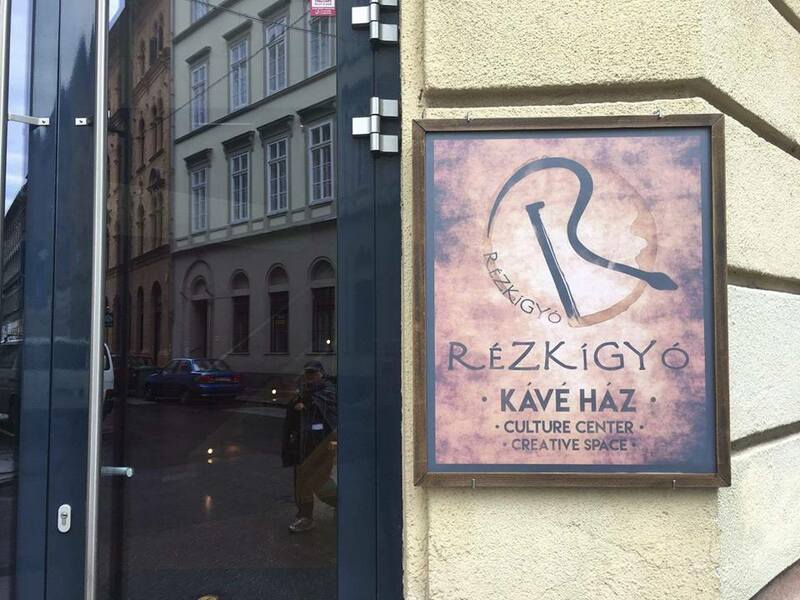 Rezkigio, the coffeehouse ministry of the Youth With A Mission (YWAM) base in Budapest, Hungary. This pic is with Steve Johnson, Director of the YWAM base. They have a recording studio roughed in in the basement. I’ve built a few studios …. you knows? Maybe we help them finish theirs. 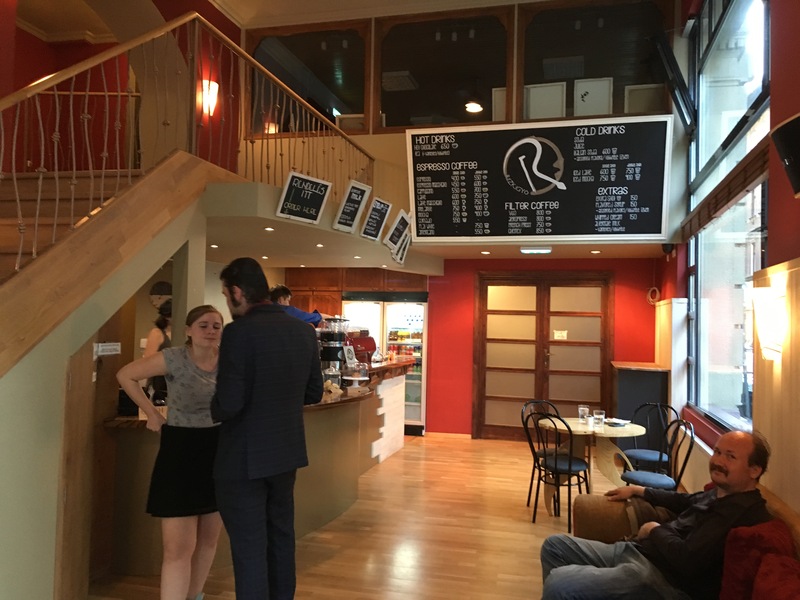 The coffee house is one of the nicest venues I’ve played in. It was fabulous! 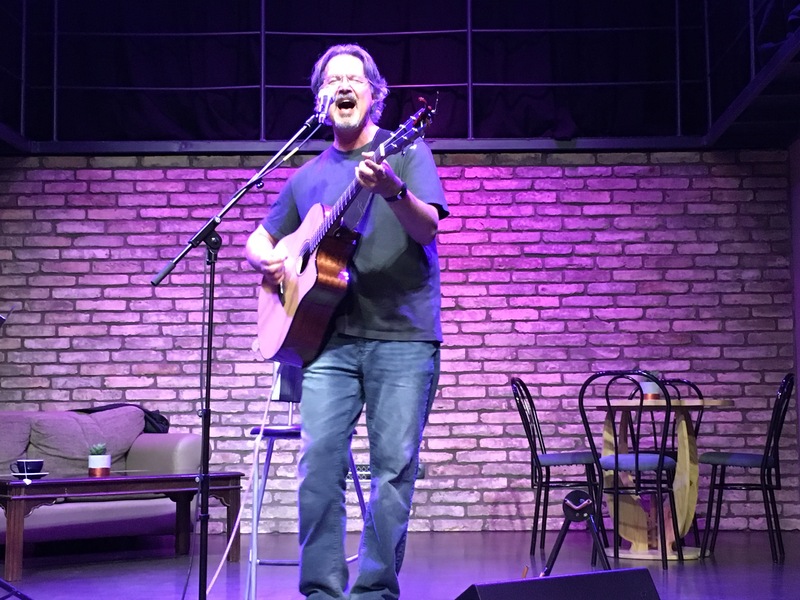 It was great to tell the stories behind the songs. I have a lot of material that has a gospel message but isn’t necessarily for corporate worship. 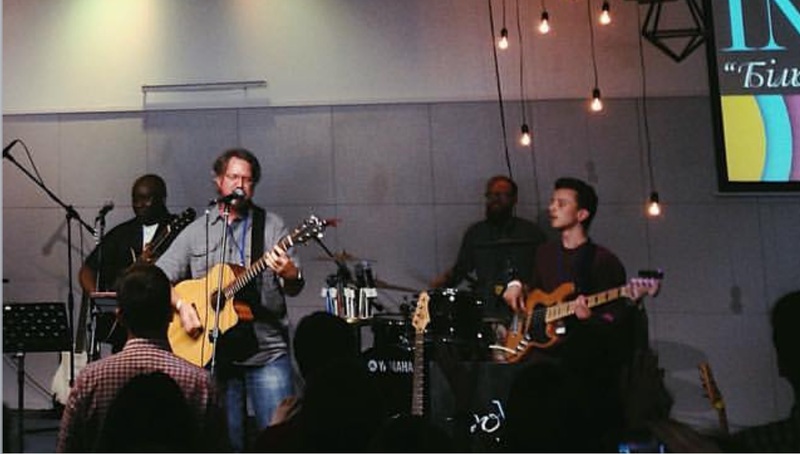 Sharing in a coffeehouse environment is very different from leading worship. 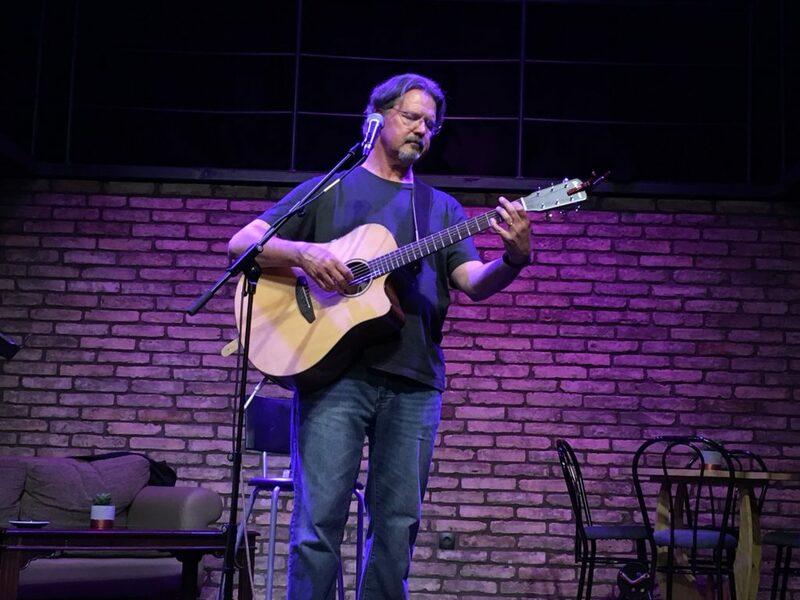 Here, you really have to connect with people through the power of what you are saying, singing and playing. It’s all about relationships. 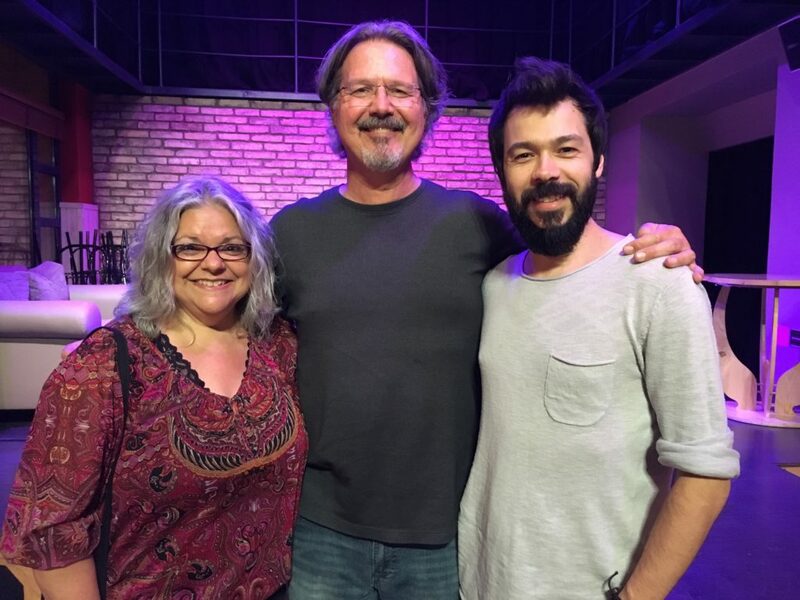 This is our longtime SOZO friend Marko from Serbia, another worship leader and creative artist. 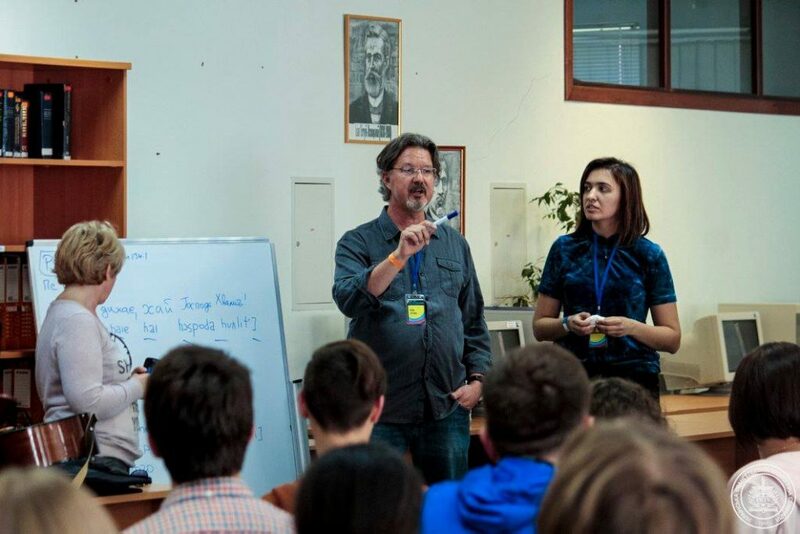 He’s on staff at the YWAM Budapest base. The Ez Az A Nap Festival is one of the longest running Christian music events in Europe. Attendance is about 20,000 people. My song “A New Anointing/This Is The Day” is translated as “Ez Az A Nap”. The main event was preceded by a 24 hour non-stop worship and intercession. I lead worship for the final hour. Quite an honor. Lazi Prozack recorded my song “A New Anointing/This Is The Day” which is translated as “Ez Az A Nap”. We sang “Ez Az A Nap” together and it was a real treat. I also led the chorus in Romanian and Russian. 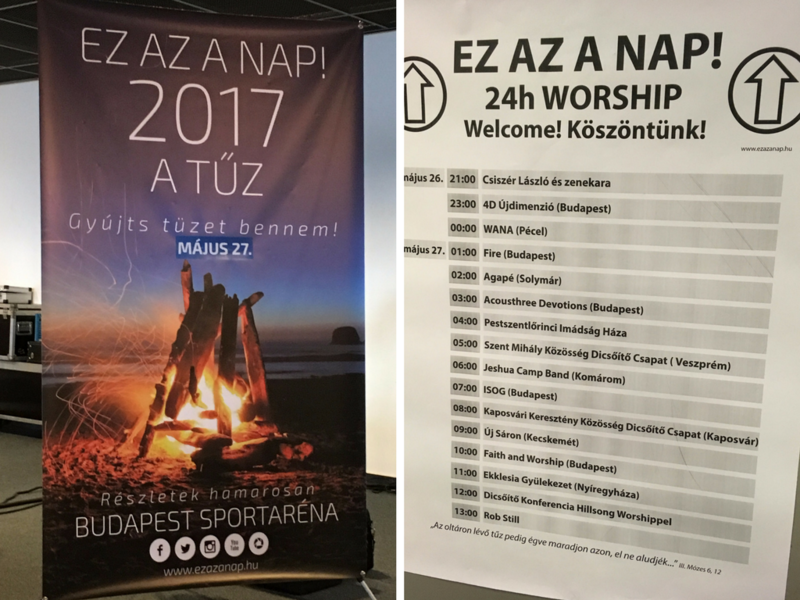 Afterwards Latzi, made some very kind remarks to the audience expressing appreciation from The Ez Az A Nap event our music and ministry. After that we prayed for folks. 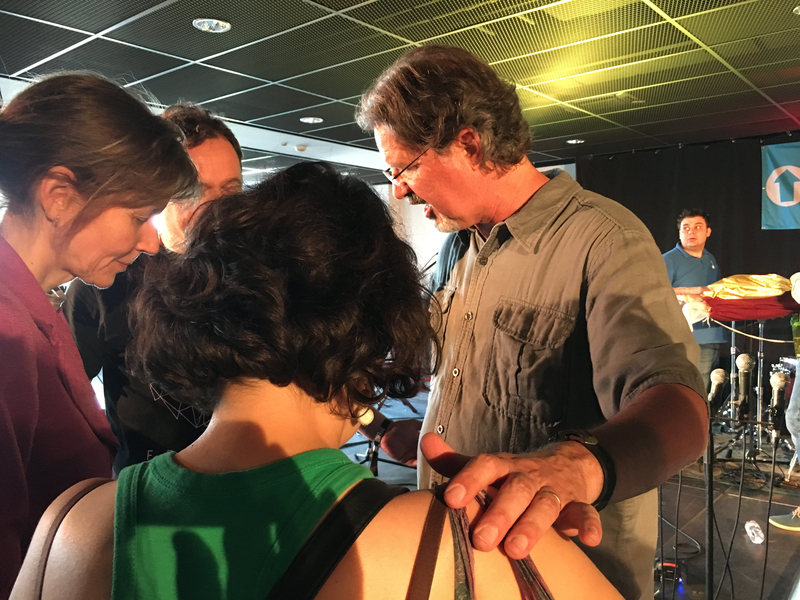 One of the major aspects of our ministry trips are the prayers, conversations and meetings that happen out of the spot light and in the margins. 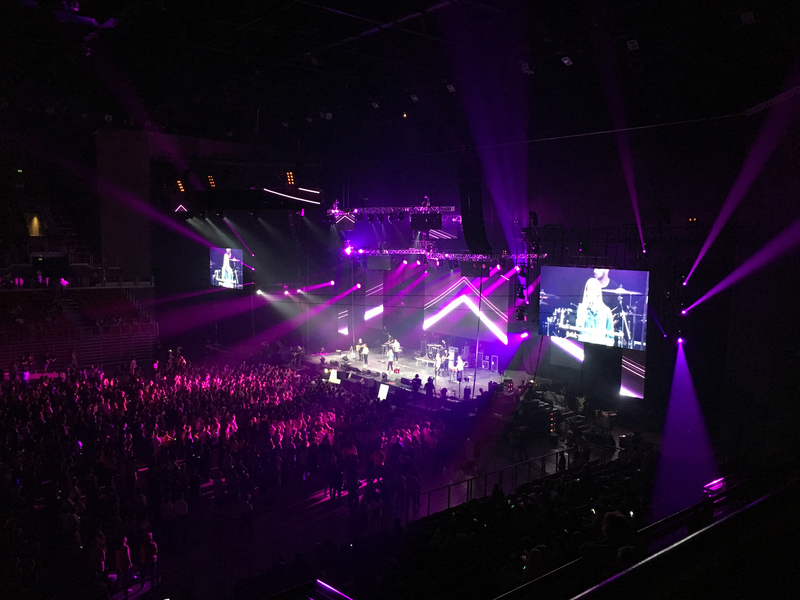 The main event was truly an amazing experience and with fantastic production. 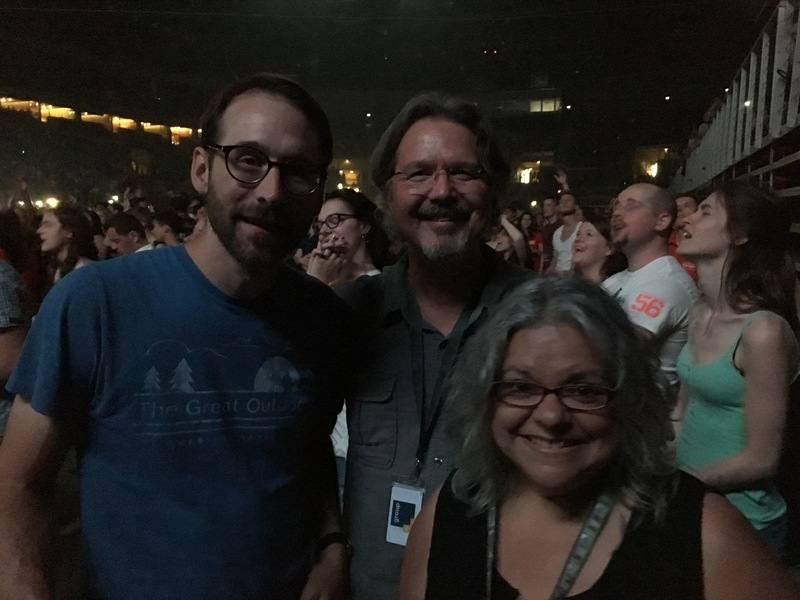 At the concert, we ran into many (many!) 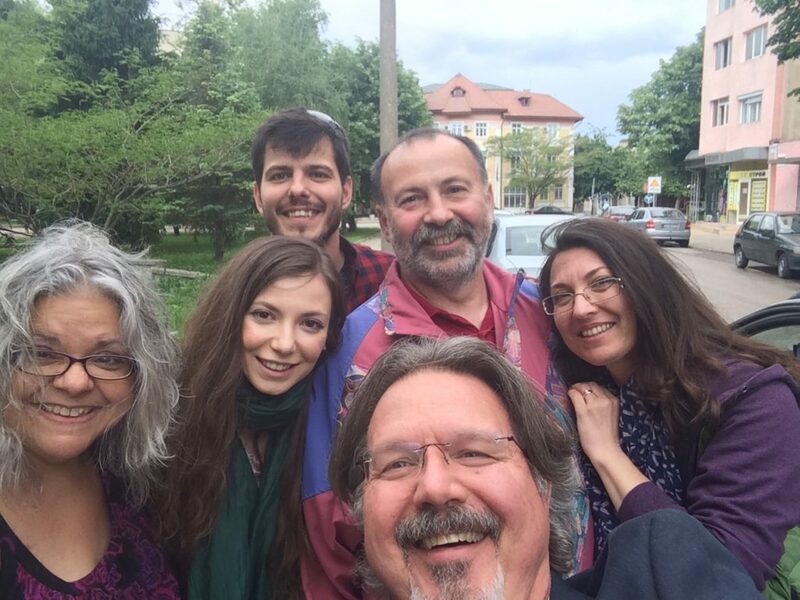 people we knew from our ministry over the years in Hungary. It’s all about relationships. 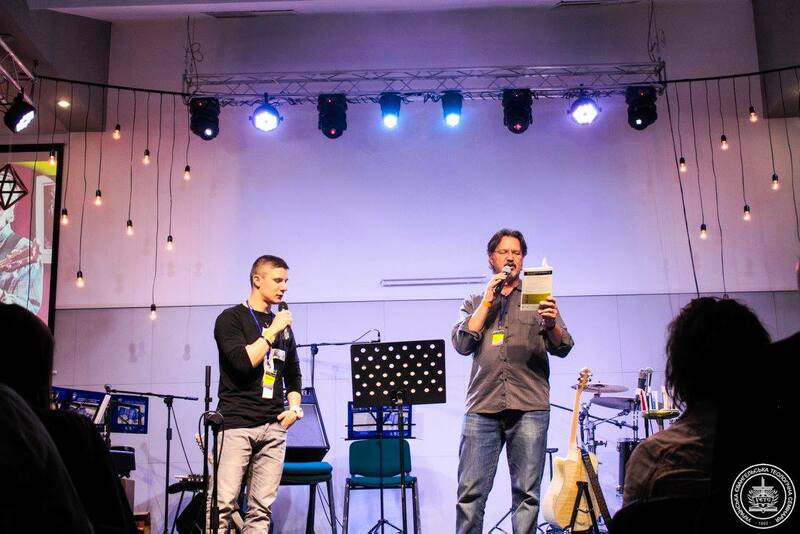 This is Mattias, a great young Hungarian worship leader. 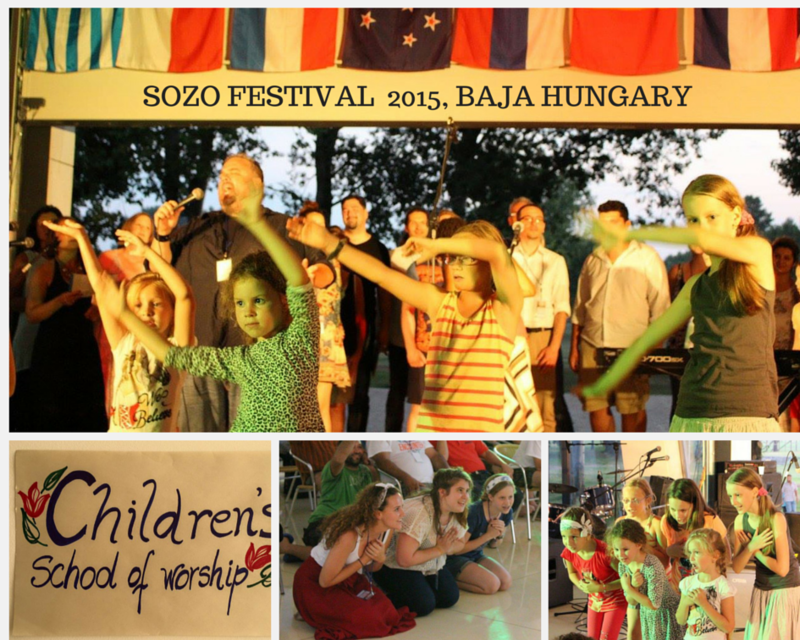 We connected and led worship together at SOZO Festival 2015 in Baja, Hungary. His group was one of the first groups to perform. They were awesome. It’s all about relationships. 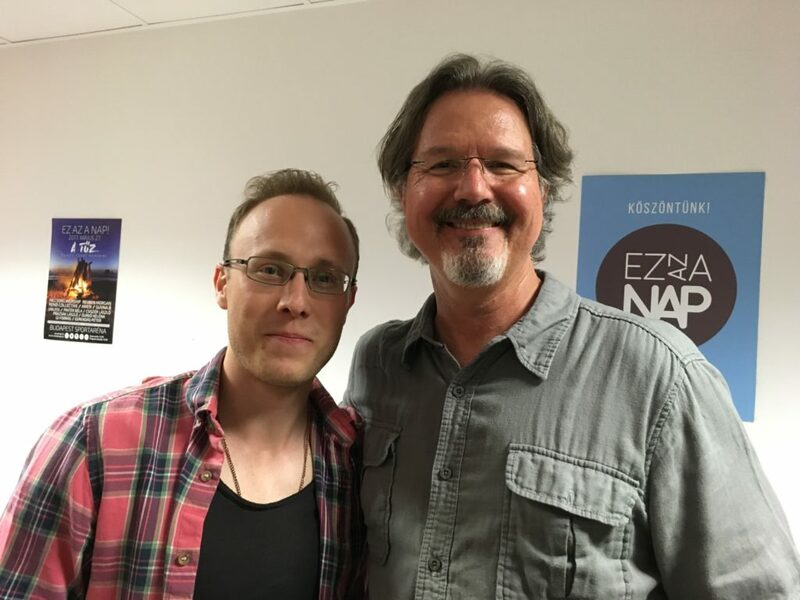 This is Matt Edwards, an American missionary / church planter in Hungary and one of the worship leaders at the early SOZO Festivals. He helped translate and record my version of Ez Az A Nap (on The Forerunner album). It’s all about relationships. 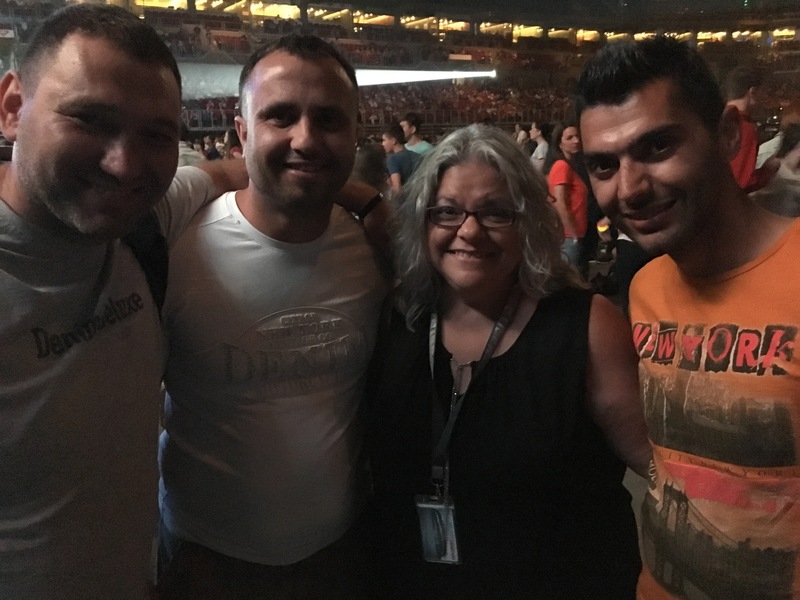 These are our gypsy friends from SOZO Festival, Karlos, Ruslan and Ruslan. 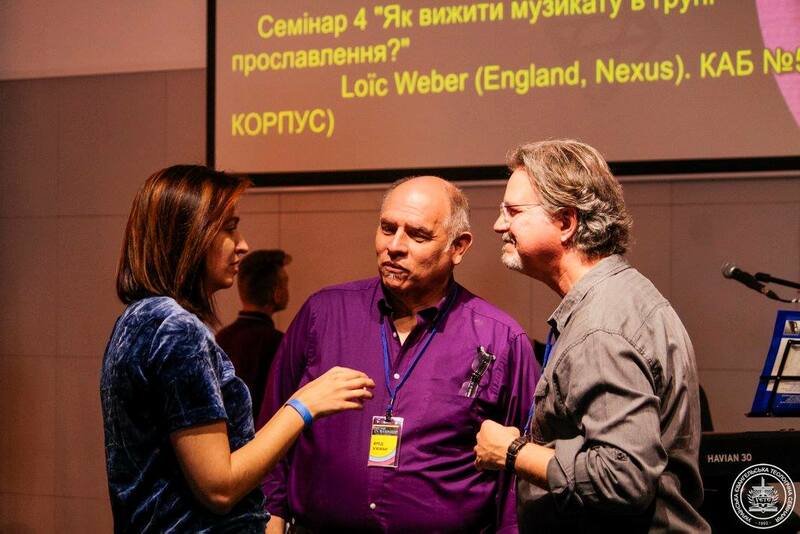 They help lead Christian ministry in a gypsy camp of Hungarian gypsy’s who live in Ukraine. They speak at least four languages. We have an invitation to go to their camp and do a worship training event. We hope to do that in 2018. 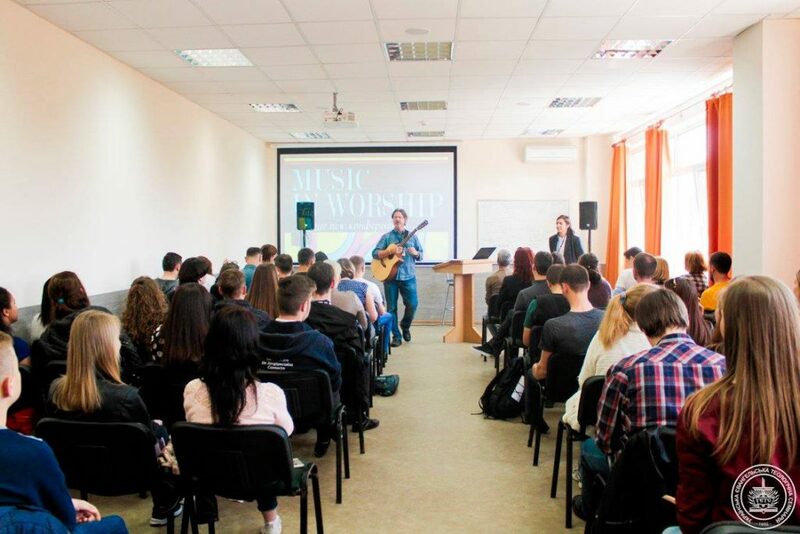 A real need for the discipleship training in the area of worship, music, and leadership. It was a great blessing to see the Lord use us in this capacity. The vital importance of prayer partners. The Lord showed himself great in so many situations! Financial support from the West is also strategic. [i.e. 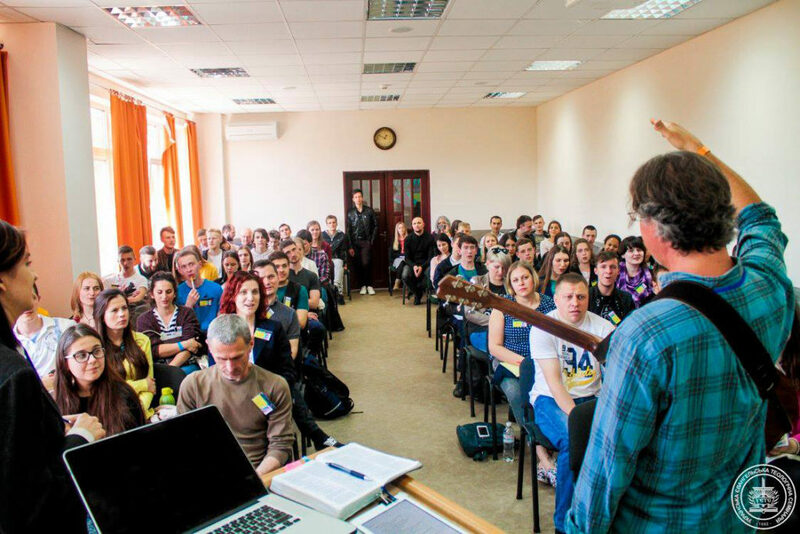 Ukrainian Evangelical Theological Seminary – scholarships funds needed]. You Can Partner With Us ! Rob Still Ministries also donates books, instruments and other resources. 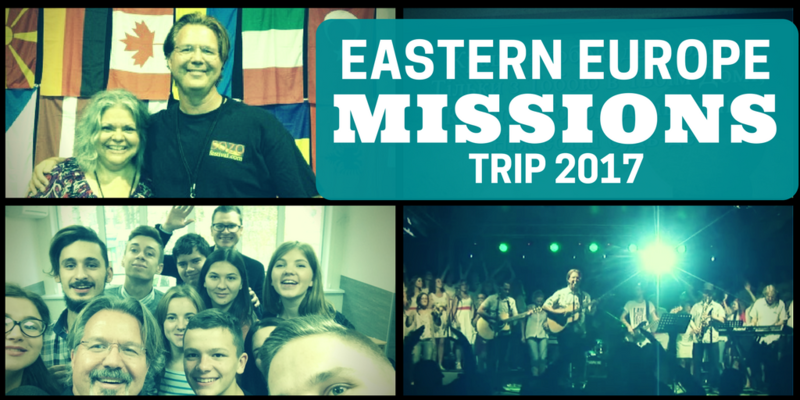 If you would be interested in helping fund our missions trips, you can make a tax deductible donation here. We serve “the least of these”. Their financial need is great and there are many difficulties for our Christian brothers and sisters around the world. We raise our own support and pay our own travel and expenses. Our work – and theirs – is only possible with God’s grace and your partnership. So, thank you so much for your prayers and financial support! God is changing lives for his glory through our missions projects. We can not go without the help of friends like you! 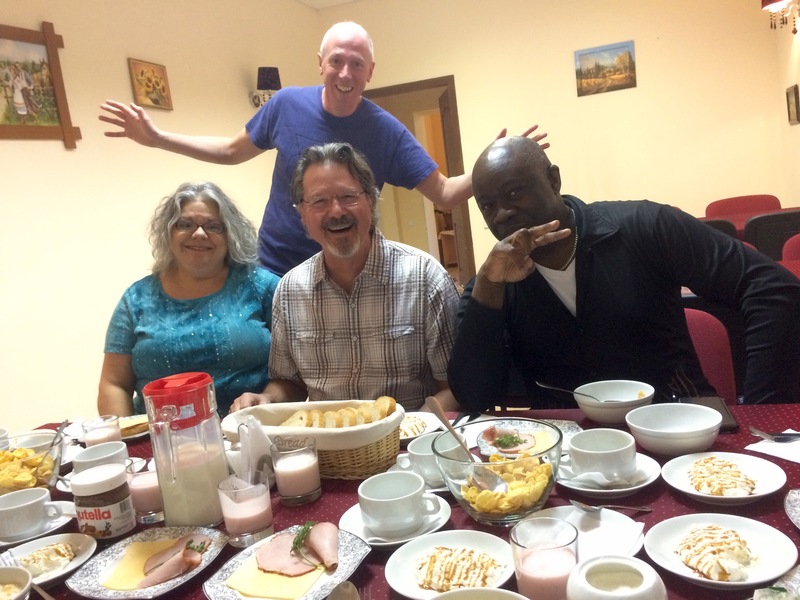 Well I’m excited to return to Eastern Europe this year with my wife Ivalene. During the month of May 2017 we will teach in Ukraine, then minister in Bulgaria, lead worship in Hungary and finish in France. We’ll depart the USA the beginning of May and return at the end of May. 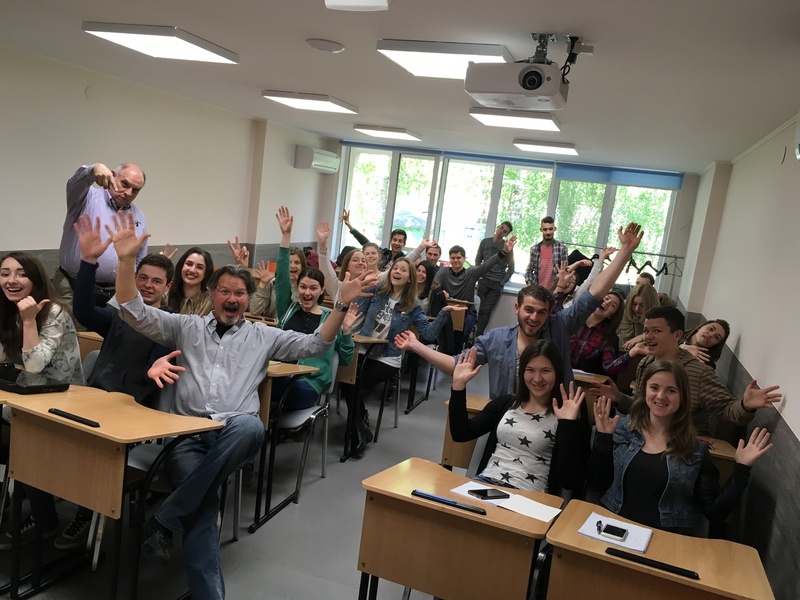 In 2016 I served teaching at the Ukrainian Evangelical Theological Seminary in Kiev, Ukraine. I taught my course Practical Theology of Worship, led songwriting workshops and a staff retreat. Our ministry also donated an acoustic-electric guitar, several books for their library, CD’s, songbooks and other music resources. 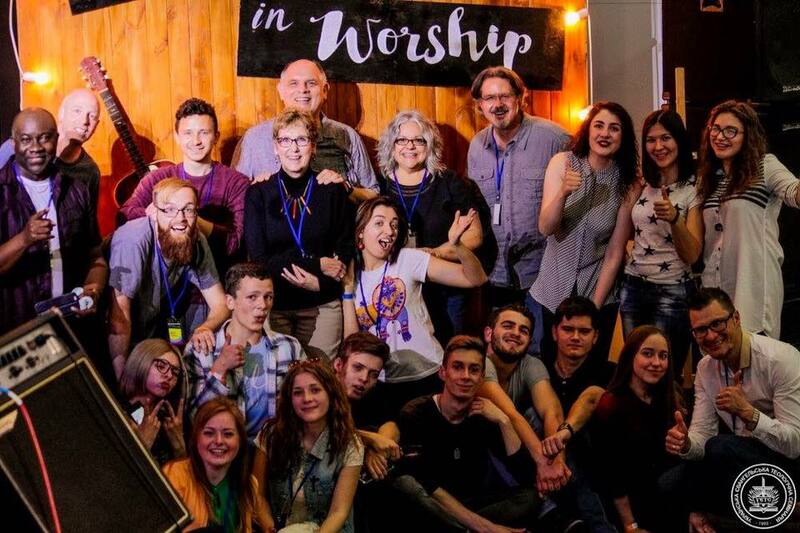 This wonderful bible college is training the next generation of young adults to be musically skilled and spiritually anointed leaders. 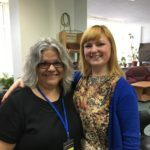 Here’s some take away’s from my missions trip to Ukraine. 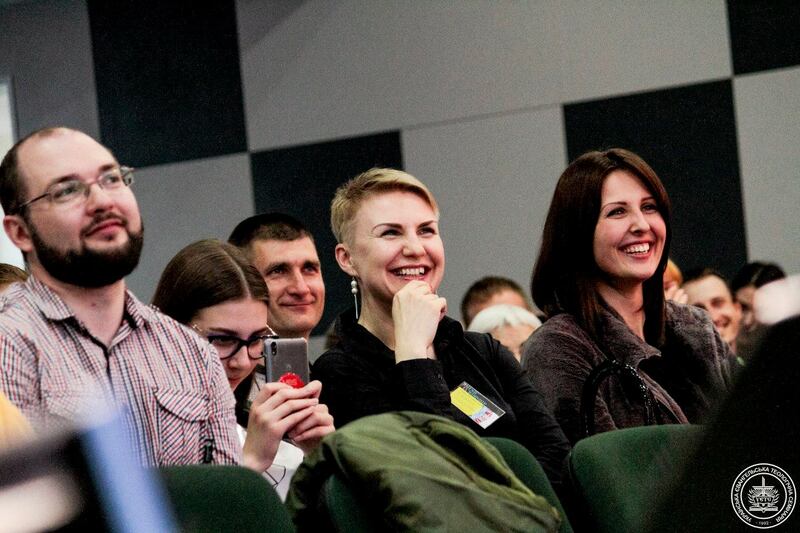 Ukraine is a strategic nation. Largest country in Europe (land mass). Had a Revolution in 2013-14. Maidan massacre led to overthrow of corrupt president. Corruption is still a big problem, endemic to historical culture. 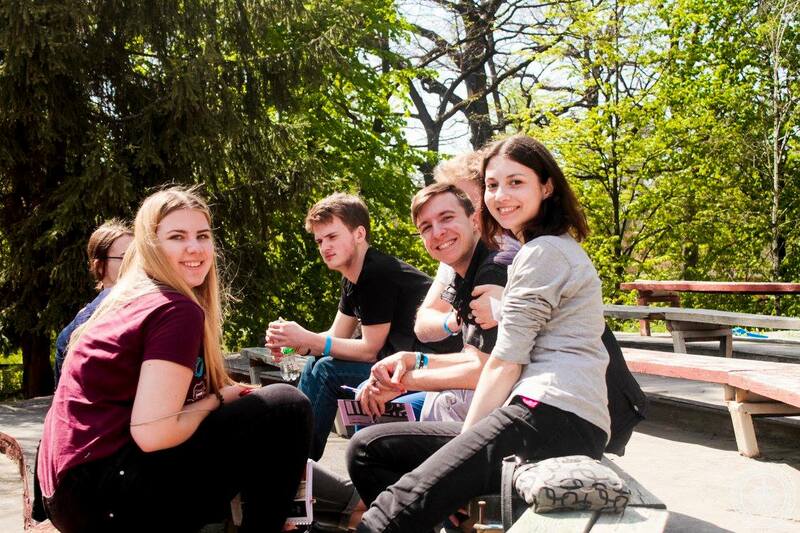 The students and staff are courageous, passionate, dedicated followers of Jesus. 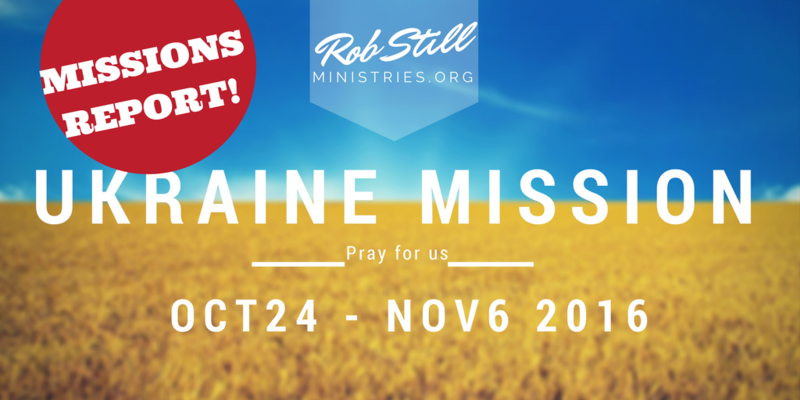 I’m delighted to say I’ll be venturing on my first ever ministry project to the nation of Ukraine. I’ll fly out October 25 and fly back November 4, 2016. I’m planning to be back in church at HFUMC on November 6th. 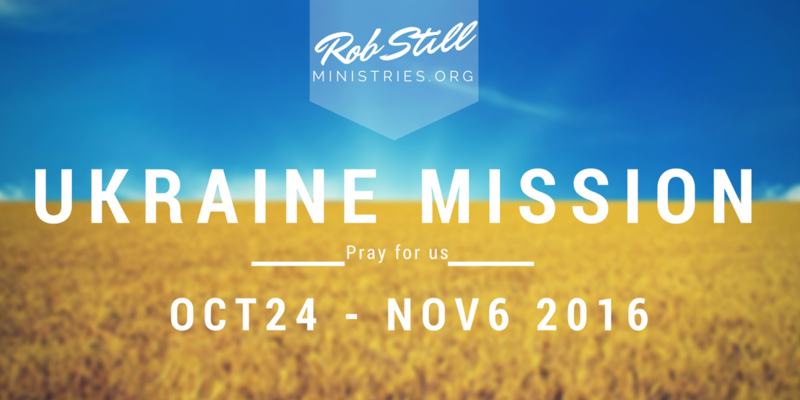 I would be most appreciative of your prayers! 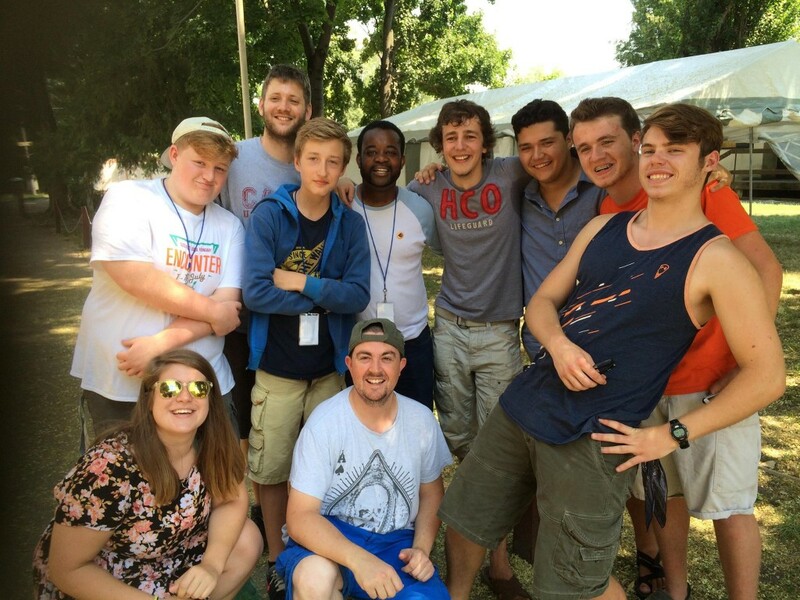 I was extremely blessed to serve on the mission field of Eastern Europe this summer in Hungary and Romania. Once again, I experienced the Lord bearing good fruit through the ministry organizations we partner with. 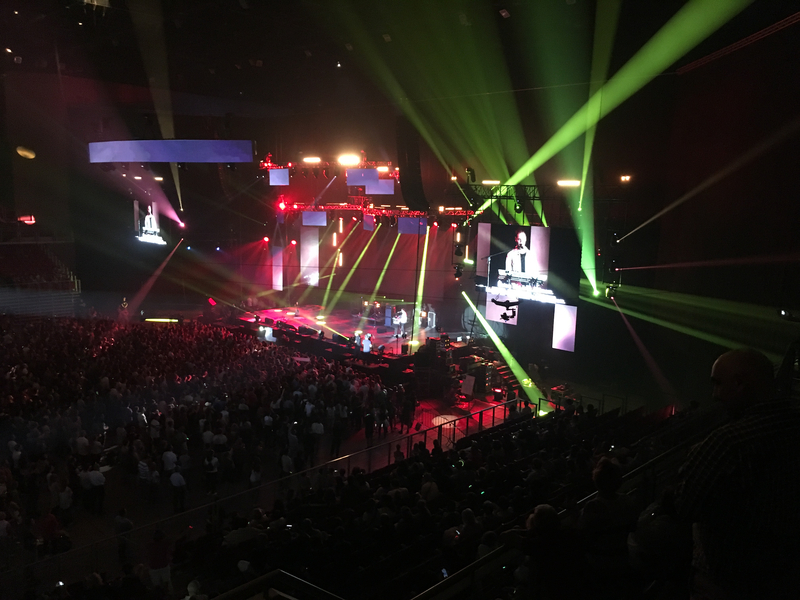 About 200 people representing over 20 nations congregated to be discipled, equipped and mobilized at SOZO Festival 2015, July 13-20. SOZO international staff (this year about 60) arrives at the beginning of the week, sets up the logistics for event, and serves participants through out the 4 day conference. It’s a lot of work and everyone stays very busy! 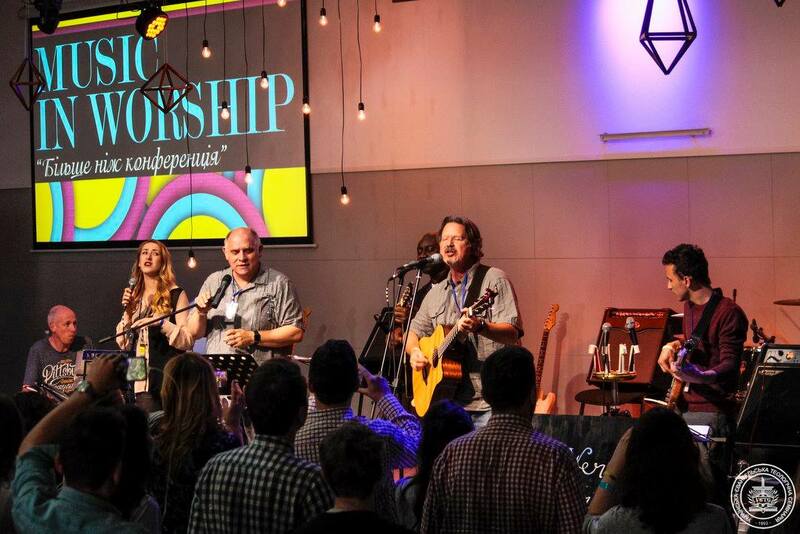 The SOZO Conference features a daily morning worship and ministry time. 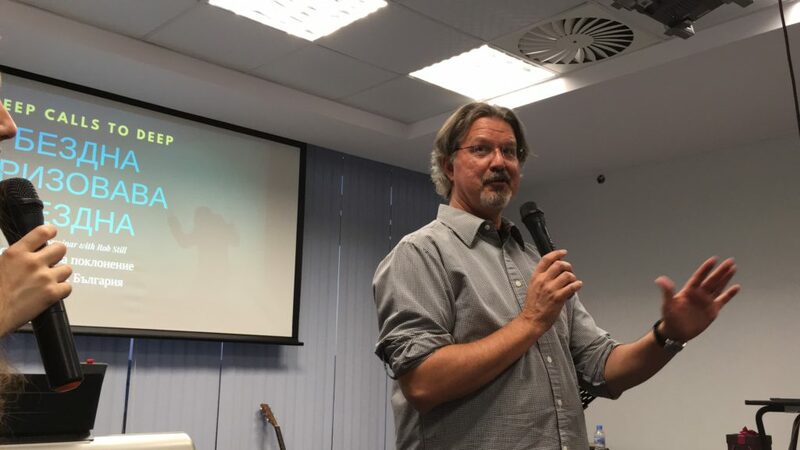 Ministry messages were from a human trafficking/rescue ministry in Budapest (day 1), a church planting ministry in Romania (day 2), and an intense session of intercession for the many nations and ministries represented (day 3). After the morning meetings each day, there were six hours of discipleship seminars and workshops held through out the venue. I led the Worship Seminar with Cathy Heiser from Belmont Church. There was also a Leadership Seminar, Youth Seminar, and Children’s School of Worship. Finally, a Gospel Choir track was held at the end of each day. My main role is to organize and facilitate our daily worship services. We put together a different mulit-national team for evert session. 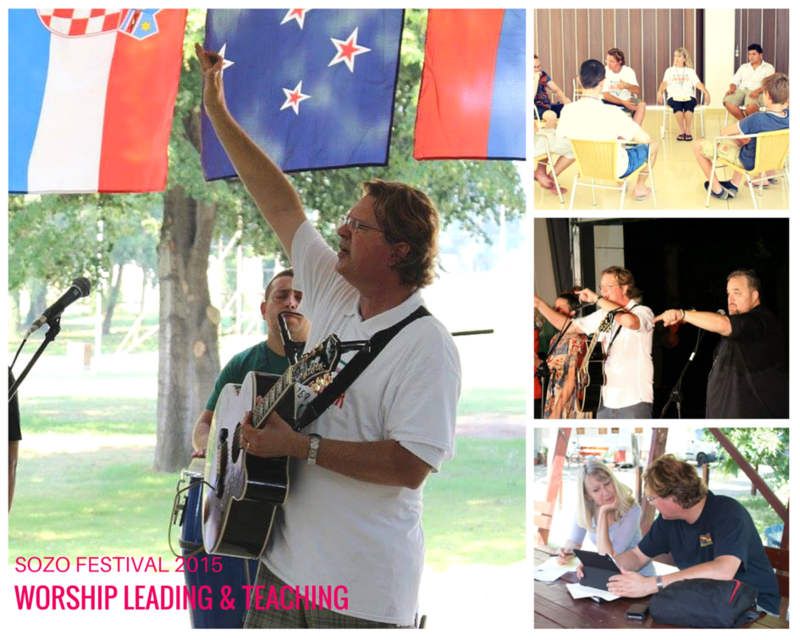 Top Right: Cathy Heiser and I taught 8 worship leading seminars. Right Middle: Tom Long and I singing “Oh how He loves you” during the Jesus La La Song; Bottom: Me & Cathy preparing our teaching notes. 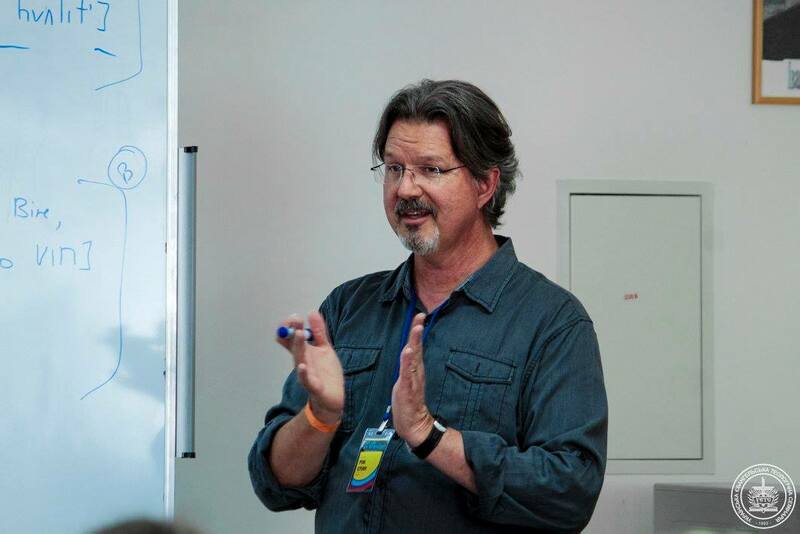 There is high value in the teaching and training that happens in these workshops. This is a major reason SOZO is so transformative for the participants. 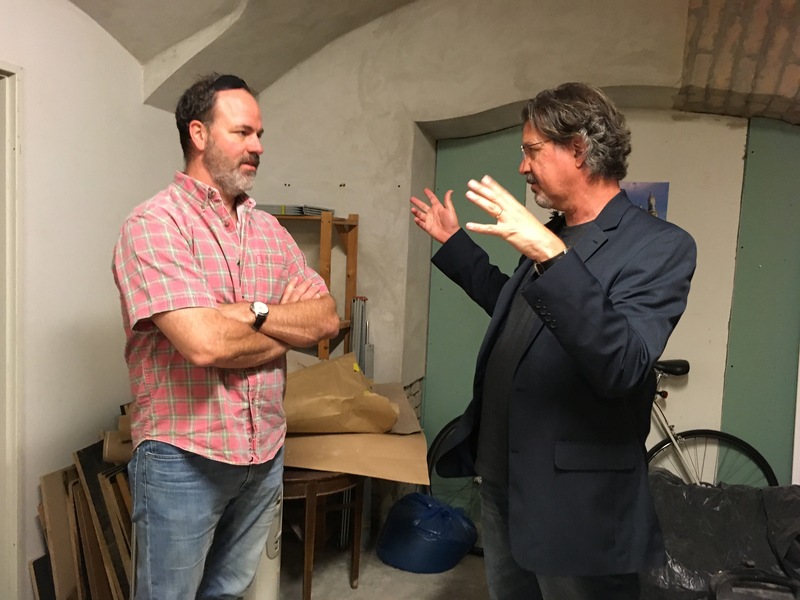 In America we tend to take training opportunities for granted, but in this part of the world, the equipping and personal connection with instructors is eye-opening and life giving. Through the years I’ve met many people through out this region who credit a SOZO seminar or leader who changed their perspective and their life. In the evenings we held concerts open to the public on Wed, Friday and Saturday night. 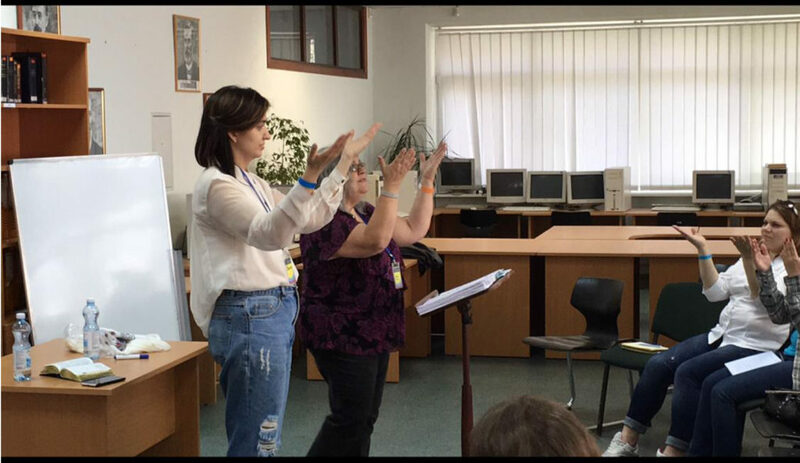 Guest artists came from Hungary and Romania. 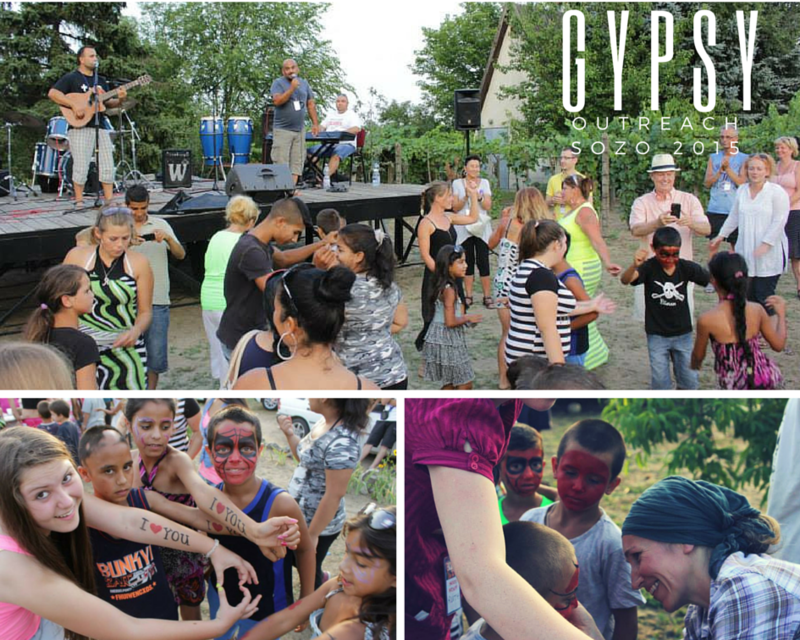 The gospel outreach to the Roma (Gypsy) village outside of Baja. The children loved the face painting! Thursday night we shared the love of Jesus in a fun gospel outreach to the Roma (Gypsy) village outside of Baja. The children loved the face paintings, balloons and games. The gypsy worship band “Amaro Del” shared with a powerful anointing to proclaim the gospel. We also shared a dramatic skit. Then the band finished up with a big celebration and dancing broke out! Several kids came to the Lord through that event. It was … wonderful. Every day we have meals together. A light continental breakfast, an authentic Hungarian lunch (always with soup), and a light dinner of salads and sandwiches. 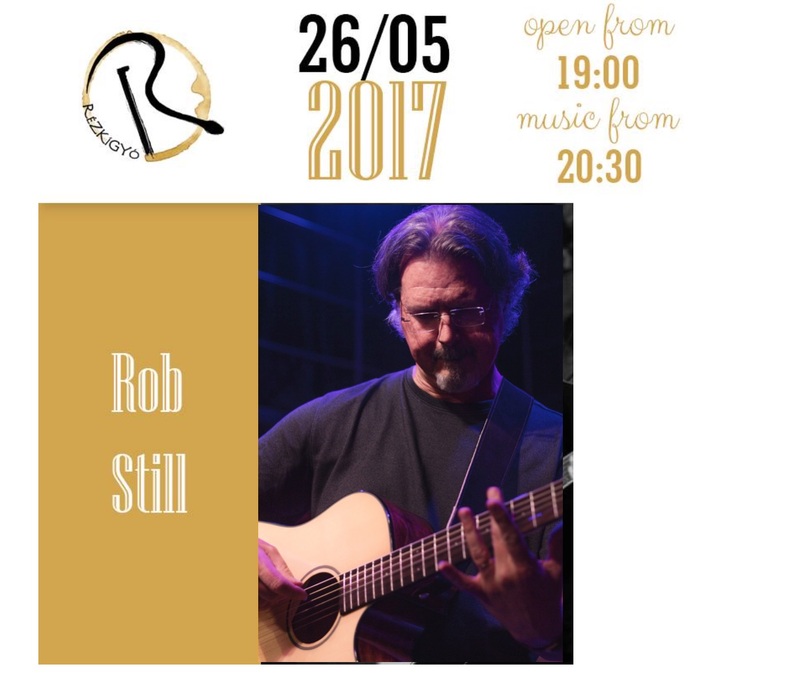 Later during the evenings, we have “Cafe SOZO” where folks share acoustic music in an outdoor coffee house atmosphere. Some are amazing, a few are humorous, all are very creative and quite different. It’s just a beautiful thing to have a safe place to share your art and be comfortable in your own skin. So … the SOZO rhythm is an exhausting pace. But it’s also very fulfilling, and a lot of fun. The weather that week was also extremely hot, over 100 degrees for much of the event. Our worship times were celebratory! Joey G from Nigeria & Wales, Sam from England, Carlos from Ukraine/Hungary/Gypsy and Andrei from Russia have a dance off. 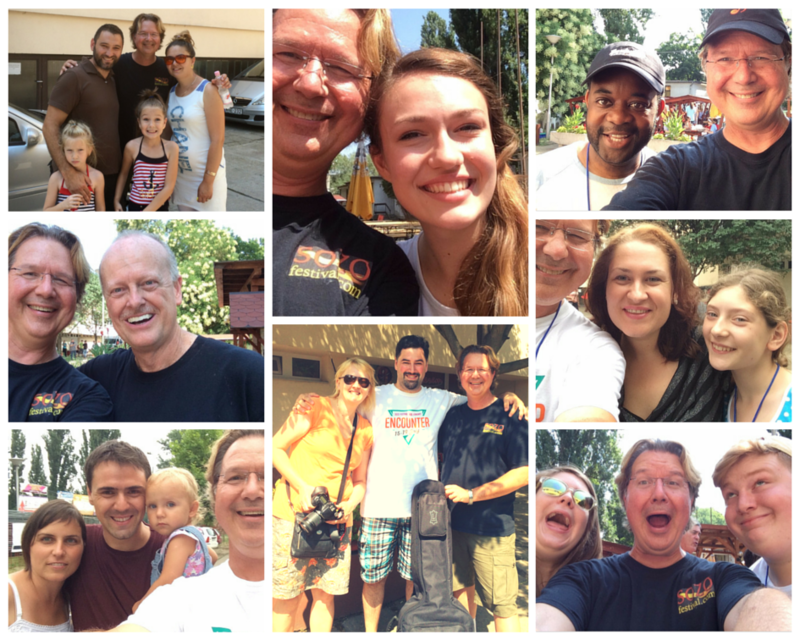 The atmosphere of “the SOZO spirit” is a beautiful thing to experience.There’s nothing else quite like it. As we live in community, breaking bread together, getting to know one another and seeking the Lord together, you see a transformation take place. Distant strangers become instant friends, ethnic enemies pray for one another, attitudes and prejudices are changed. 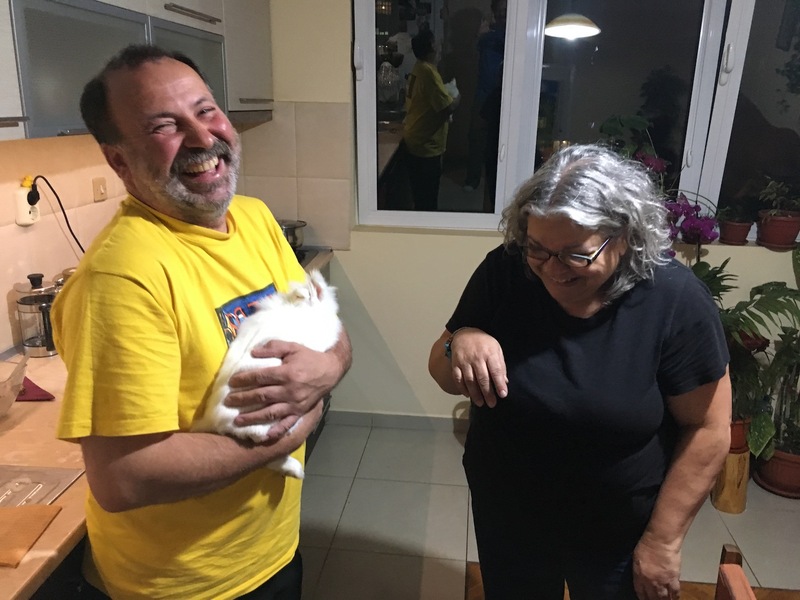 Political tensions may be rising in the volatile Balkan region, but this small group of Christians is interceding for the nations and setting an example of Christian harmony. 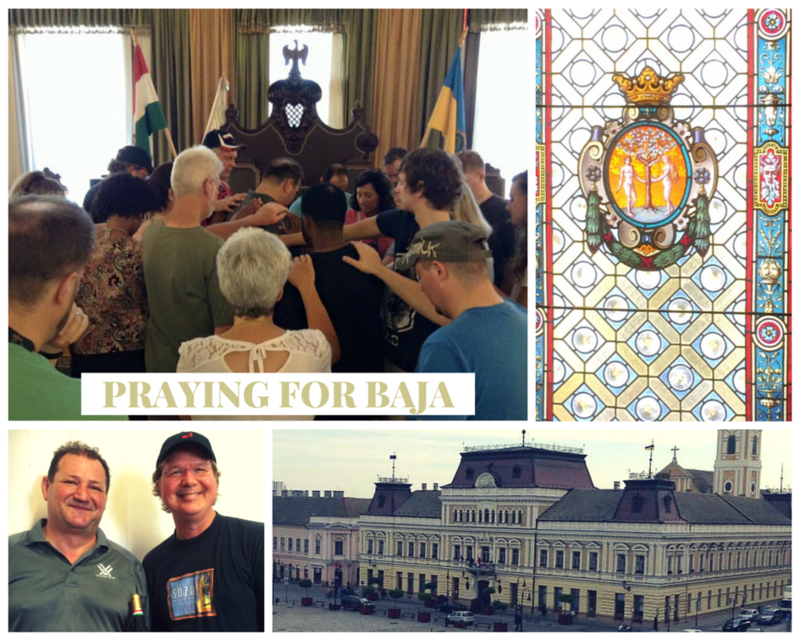 Our very first activity was to be invited into city hall of Baja (population 40,000) where we learned of the economic and spiritual background of the town. Our host was city councilman and long time SOZO friend Danca Ballint. At the end we prayed for the city and closed singing “Doxology” in the council chambers. He invited us into his office for coffee and deserts. Then he asked if we would sing more. The staff thought we were a trained choir, but we had just met! 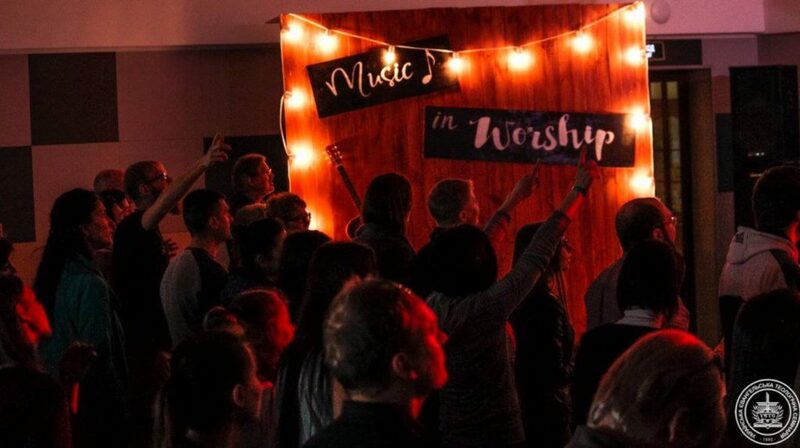 I led us in choruses of I Will Give You All My Worship, Here I Am To Worship, Mighty To Save, and How Great Is Our God. They were very touched. It was a beautiful thing and an awesome beginning! 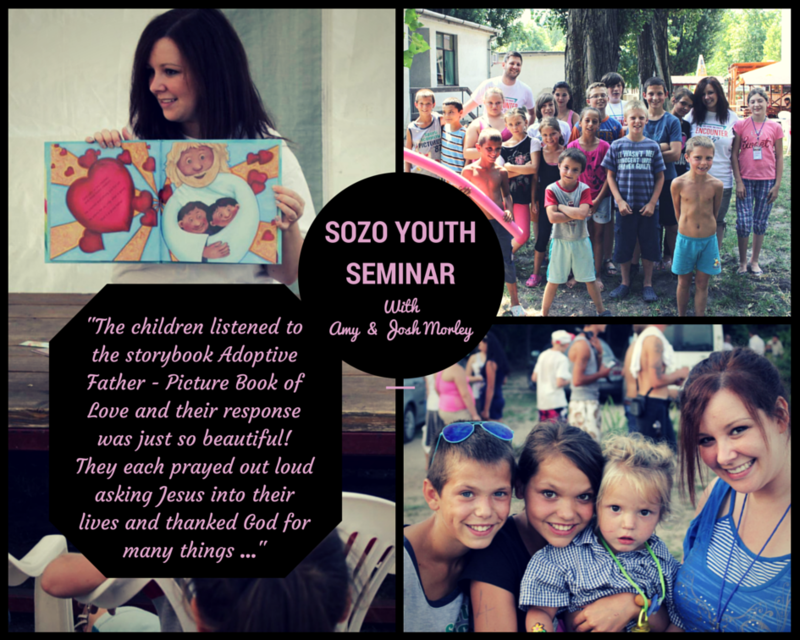 I was so blessed by the new young people at SOZO. They embodied the SOZO spirit. These guys give me a lot of hope for the future. 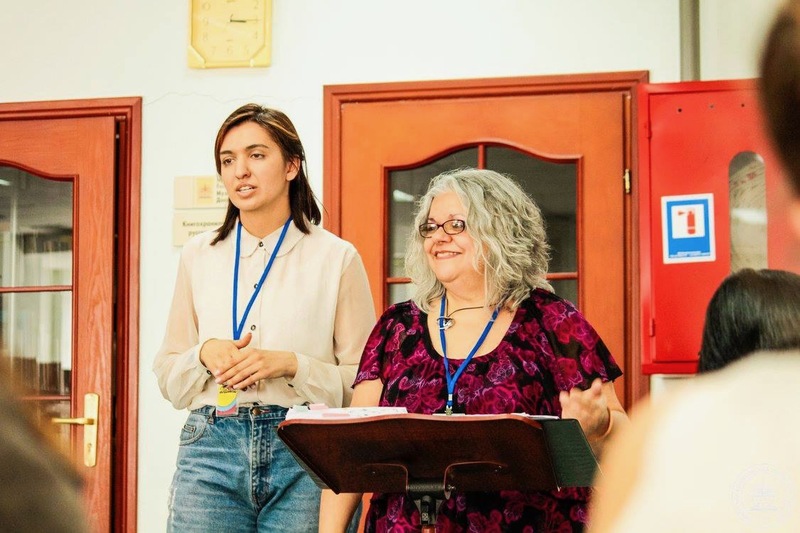 Caeli McGinty and Cheryl Tolbert put together a fine team that taught the children to worship in song, art and movement. Always a challenge with the many languages! So much talent! So much potential! Ana Molnar, 18, from Romania. 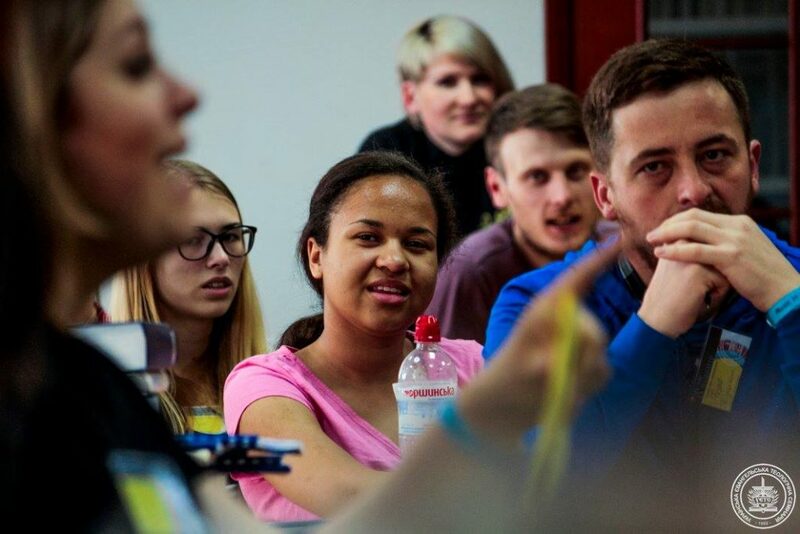 Ana Molnar, 18, from Romania has been coming to SOZO with her family every year since she was a little girl. 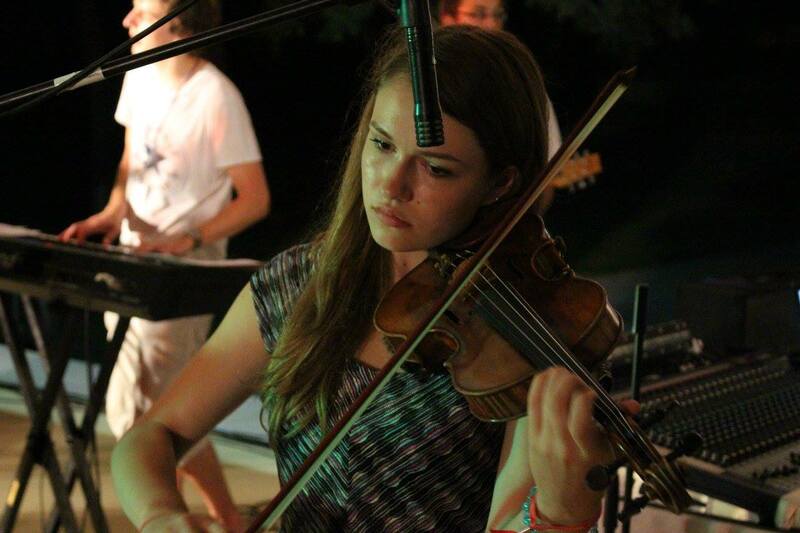 She has become one of the top young violinists in Romania, winning competitions at the national level. Top pic: Our first morning worship session. 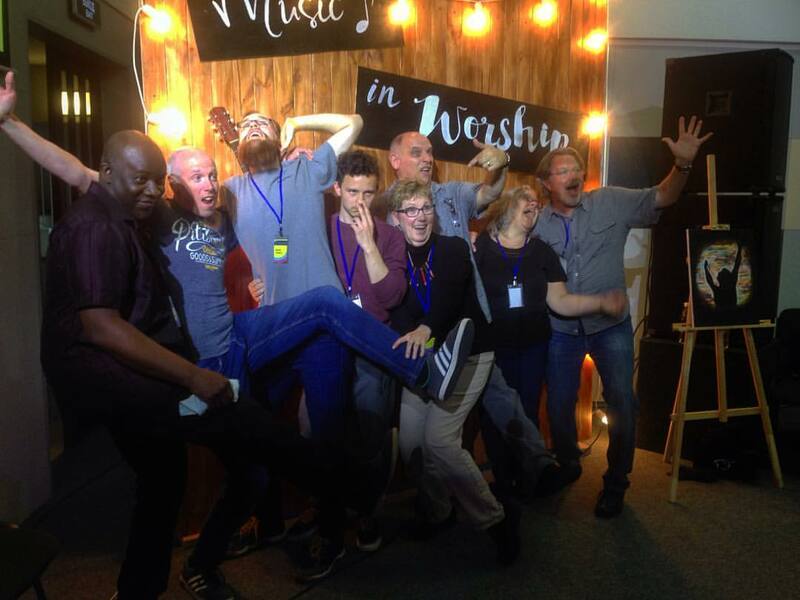 Middle pic: Tom Long, Matte from Hungary lead the worship team from Romania, Russia, USA, Albania. 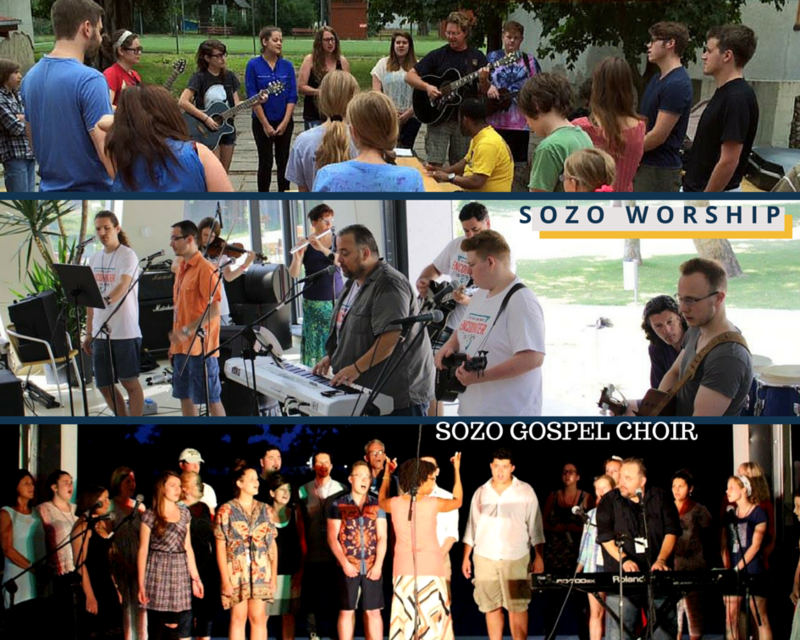 Bottom pic: SOZO Gospel Choir led by Belmont’s Cheryl Tolbert. 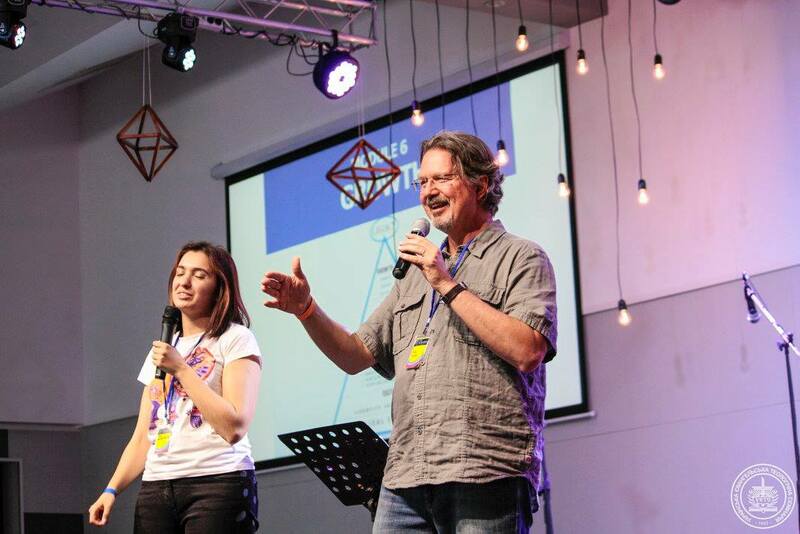 Josh & Amy Morley from England led the SOZO Youth Seminar with kingdom building results! Our U.K. friends Josh & Amy Morley from England led the SOZO Youth Seminar. They have such a big heart for youth. Amy is also a very gifted singer / songwriter / artist. One very effective method they used was to share from a story book called Adoptive Father – Picture Book of Love. After the gypsy outreach, a busload of the gypsy kids joined the group, and many gave their hearts to Jesus. 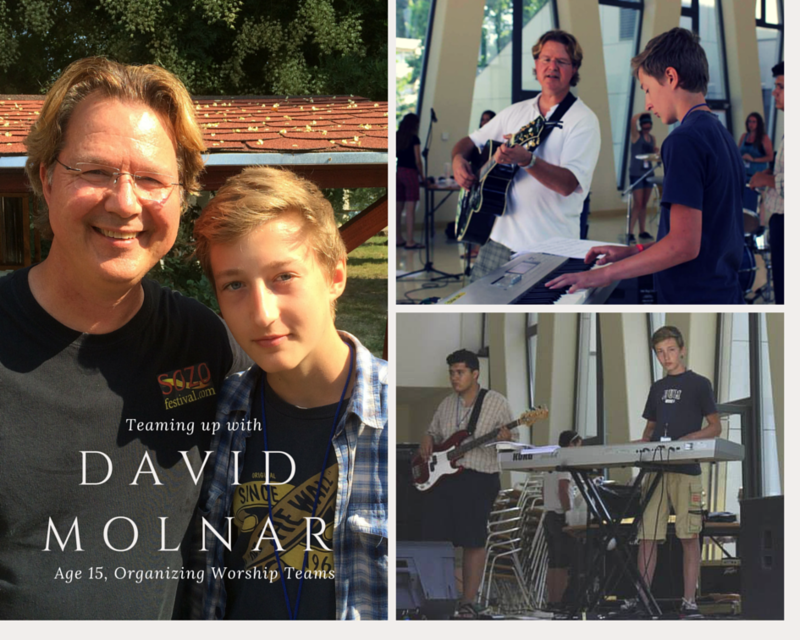 A big highlight for me was partnering with David Molnar as my worship assistant. He’s a musical prodigy, wins national competitions on piano and is just a very smart young man. Such a joy to serve together! 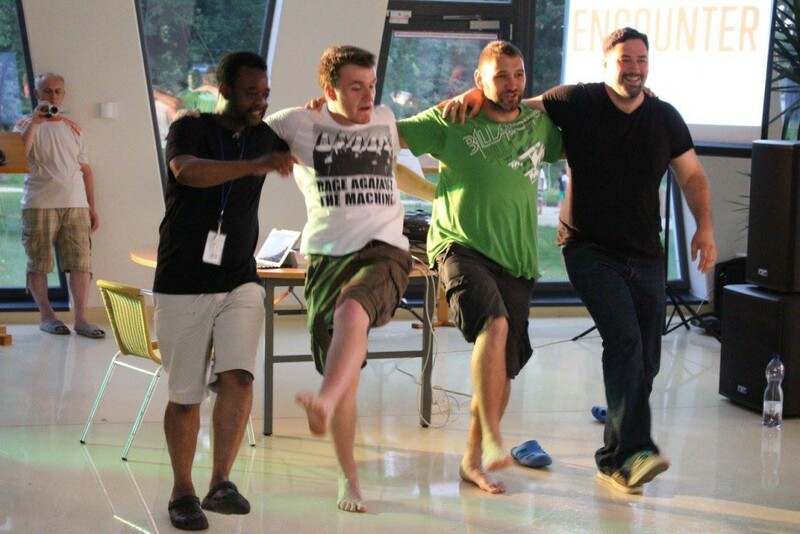 I felt led to bring out the old Jewish song, “When the Spirit of the Lord ” It feels very “Balkan” … and dance we did! 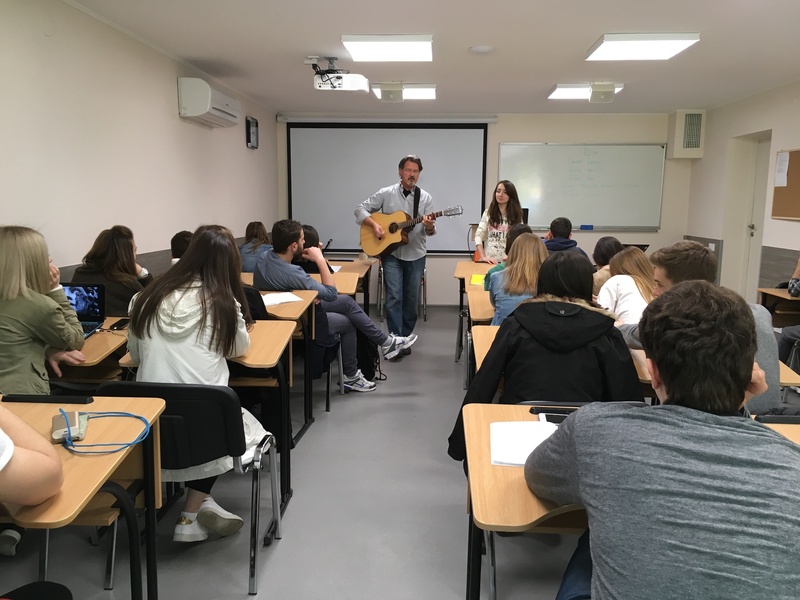 At our last morning worship session, I led worship with Erin from Visible School USA and Ruslan, a gypsy leader from Ukraine. She led a new Jesus Culture song called “Glorious”. Then I pulled out the old Delirious song “What A Friend I’ve Found”. In the middle of that we took turns having different nations take a turn singing the chorus “Jesus, Jesus, Jesus … Friend for ever” in their own languages. Everyone cheering on each nation. A beautiful SOZO moment for sure. Then we got Jewish (which also sounds a lot like Balkan music!) 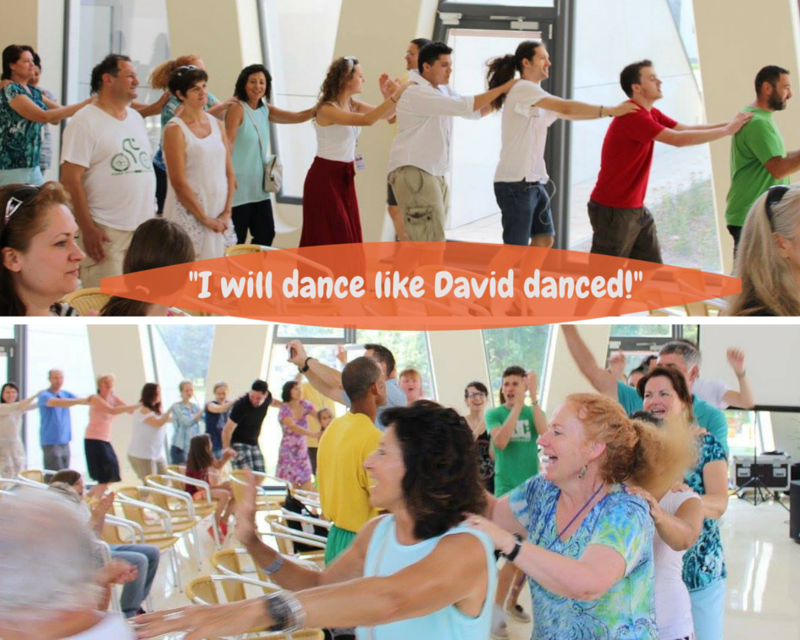 with “When the Spirit of the Lord Moves Upon My Heart, I will dance like David danced”. A huge line dance filled the room, it was awesome! This is how we roll. 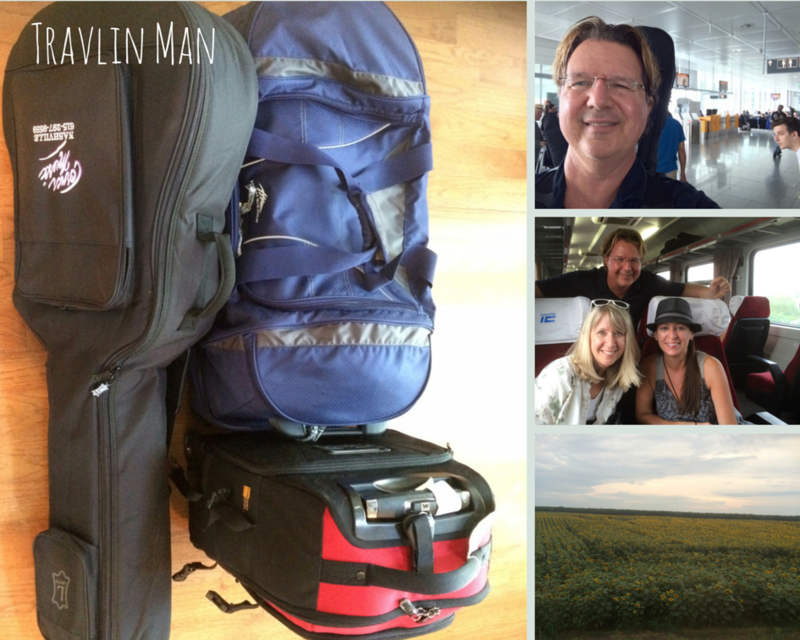 In this pic: My guitar & bags; in the Munich airport; on the train from Budpest to Baja with Cathy and Linda; sunflower fields along the way. 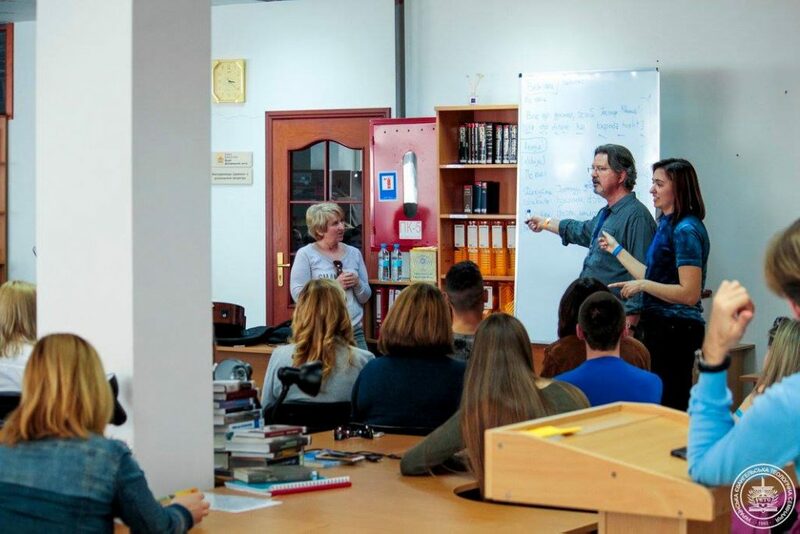 This is a good work, and based on the feedback I heard from participants new and old, the Lord is continuing to use SOZO ministry to impact the people of the Balkan nations for the glory of God. Despite “smaller” numbers than I’ve seen in the past, I think God is very much in this thing. There is something unique about the way God manifests His loving presence in this mosaic of differing cultures, skin tones, ethnic groups and especially – languages. It literally changes lives. If you can ever go, and God willing, there will be an an opportunity in 2016, I would encourage you to pray about coming as staff if this vision resonates with you. If you can’t go, pray about being a sender! Thank you to everyone who prayed and supported my trip this year. It’s a blessing to be able to go, and it’s a blessing for those who can “send”. You are a blessing!